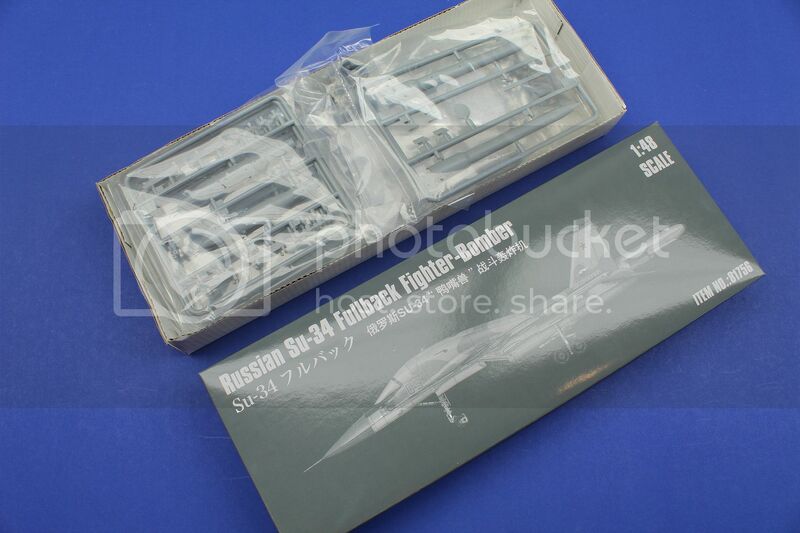 I picked mine up last Saturday from the Local Hobby shop. I will not be discussing the suggested retail price, nor sale pricing and or “value for the Money” but concentrating on what is indeed in that huge box. 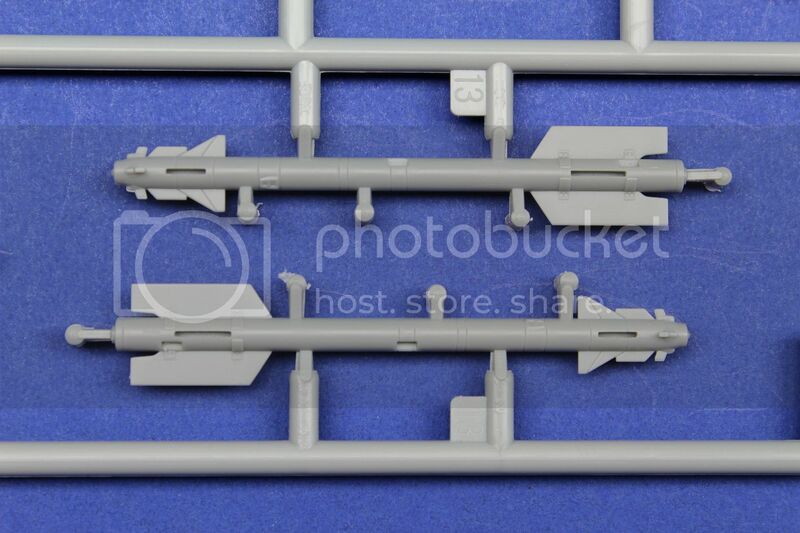 I will also discuss at the end of the review some anticipated (and already available) aftermarket upgrade set should someone be so inclined to further the accuracy or detail offered over the kit plastic. 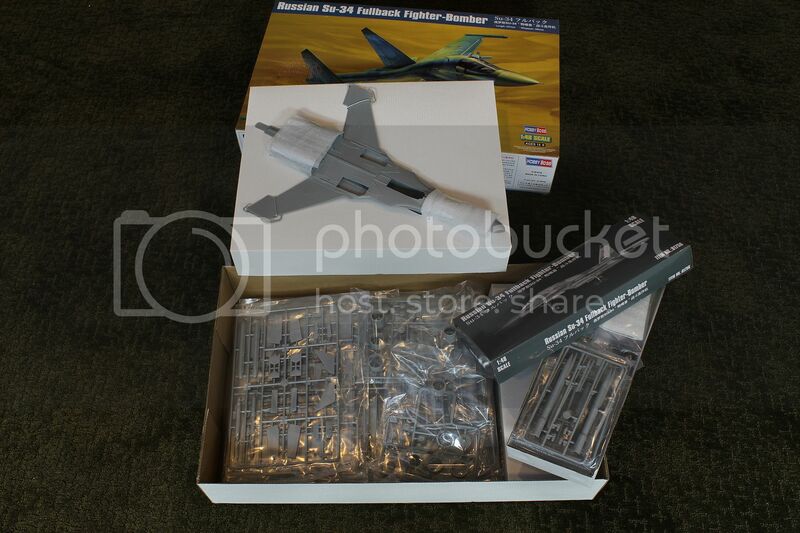 As many of you have seen on the pre-release discussion threads the box is rather large for a 1/48 scale subject. 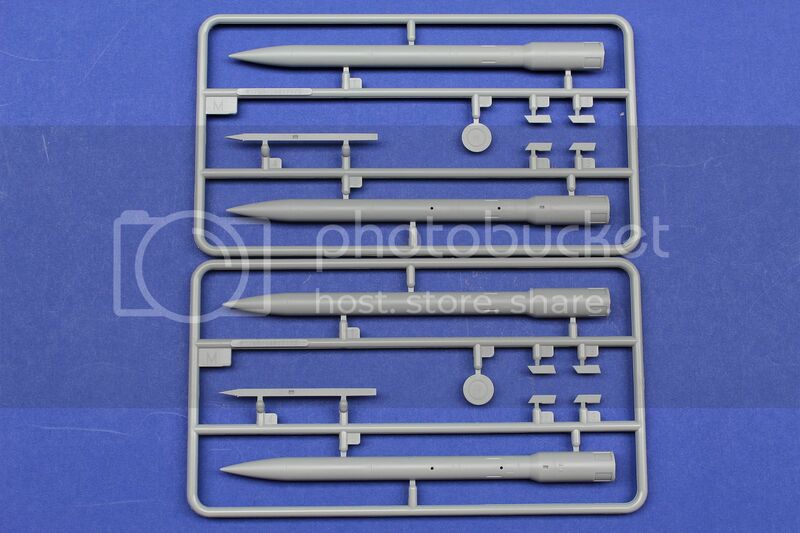 As a matter of fact the same size as my 1/32 P-61 Black Widow box from Hobby Boss. 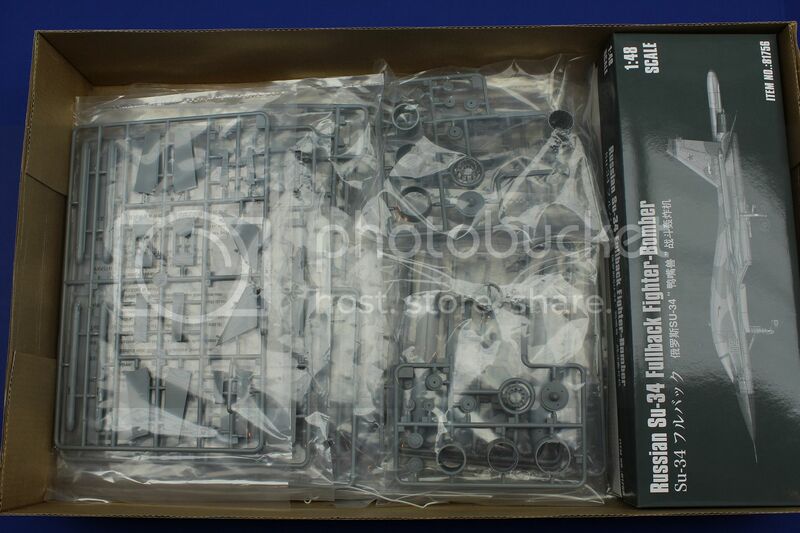 Not sure if that is coincidence and Hobby Boss is using a “standard” box that was handy to save some on the cost to produce another dimension. The box does contain two card inserts to take up some underutilized space to prevent the contents from moving around during shipping. 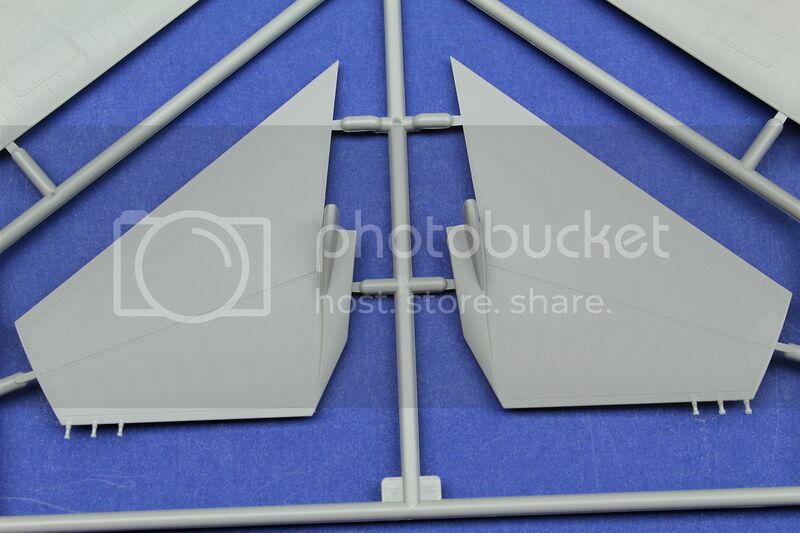 One of those has the cut out for the two large fuselage clam shell halves which are tied down with twist ties. In my example these ties were quite tight and believe it did do some slight bending of the lower half of the very thin wing tips. 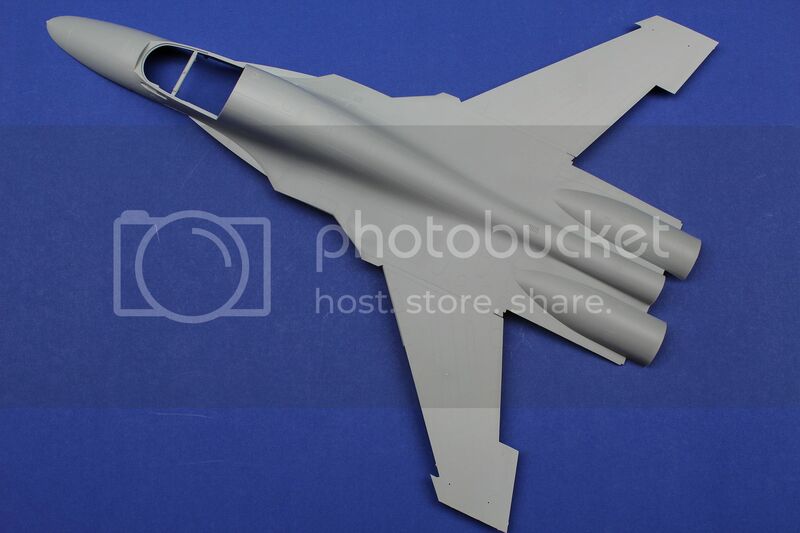 We have seen this type of “warping” in the GWH kits of the Mig-29, Great Wall quickly fixed those problems with making the box slightly larger again and using a more sturdy insert that could not bow down. I will discuss the observed warping and it is only minor a bit later in the review. 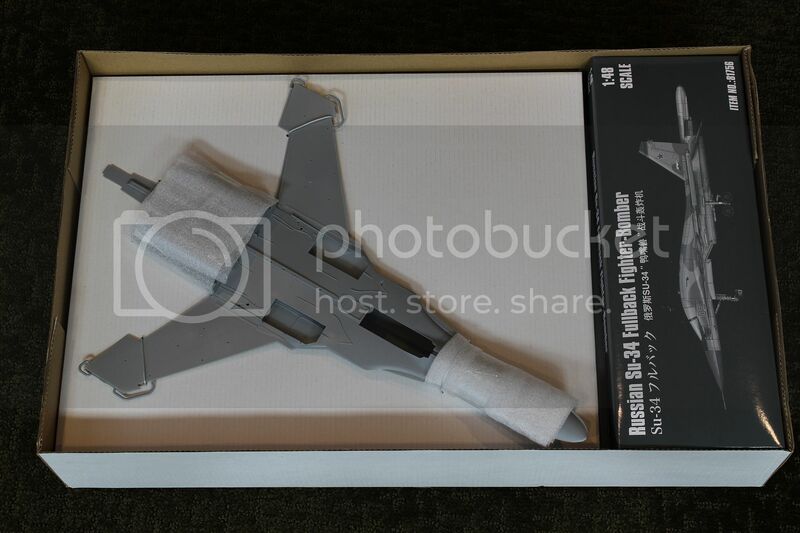 In general the box is quite sturdy and normal Trumpeter/Hobby Boss fare. 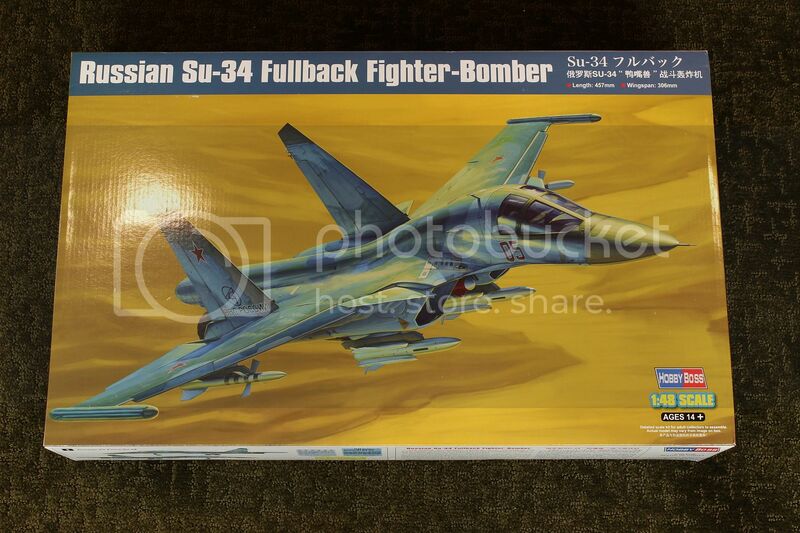 It has a nice box art of the aircraft flying over a non-distinct presumably desert area of operations. 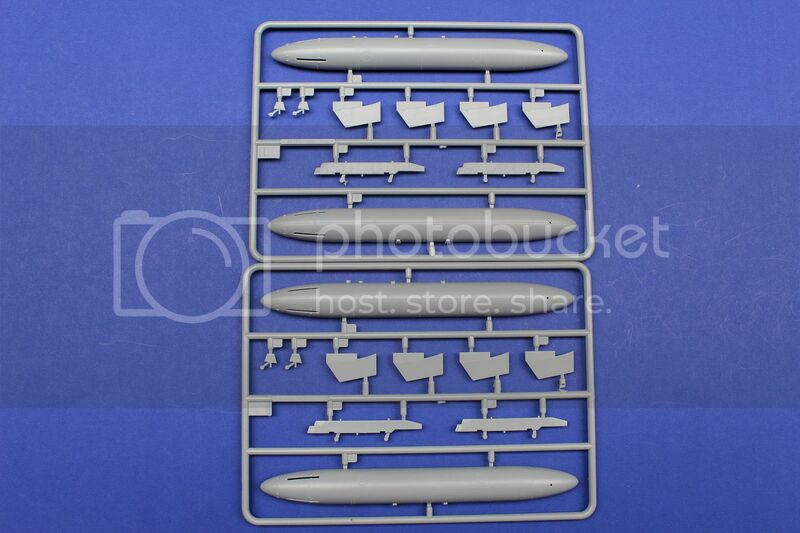 The sides of the box show two possible schemes, one of the 3 tone blue and one with the overall Grey color. More on that later in the color call out section. 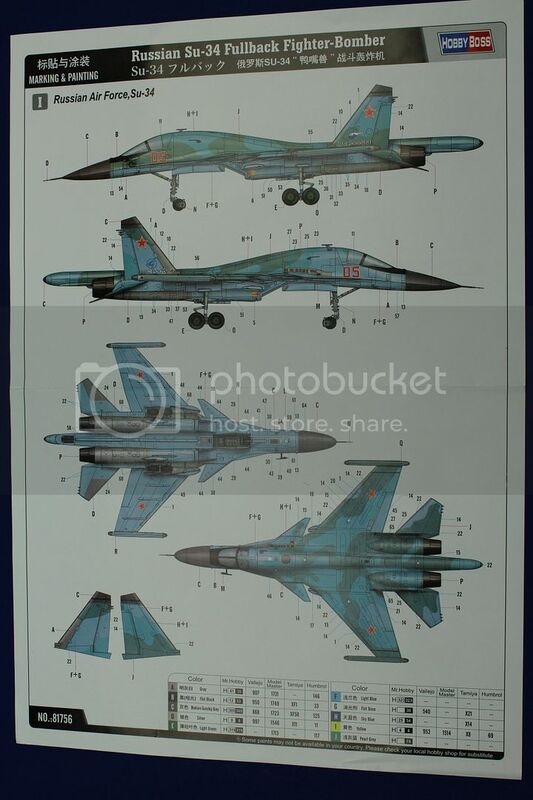 Also depicted are the Su-34 dedicated stores and several general Russian stores that can be slung under the wings. 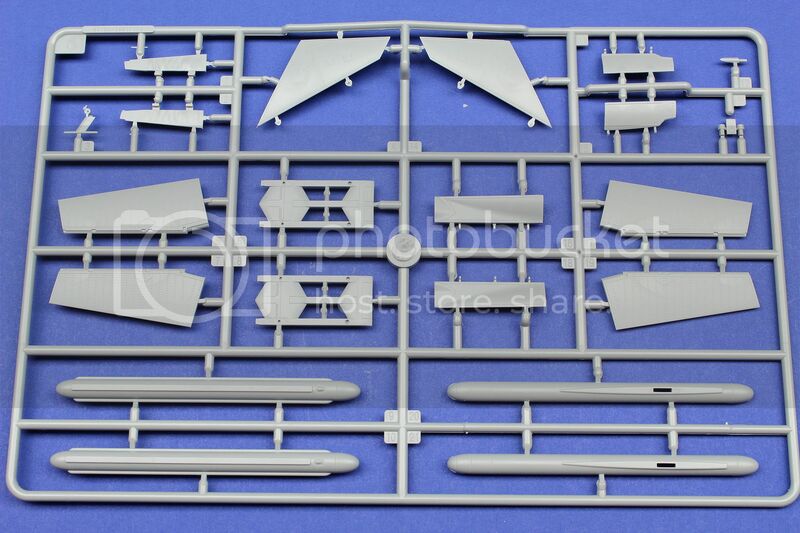 Opening up the box you will firstly find the two fuselage halves. 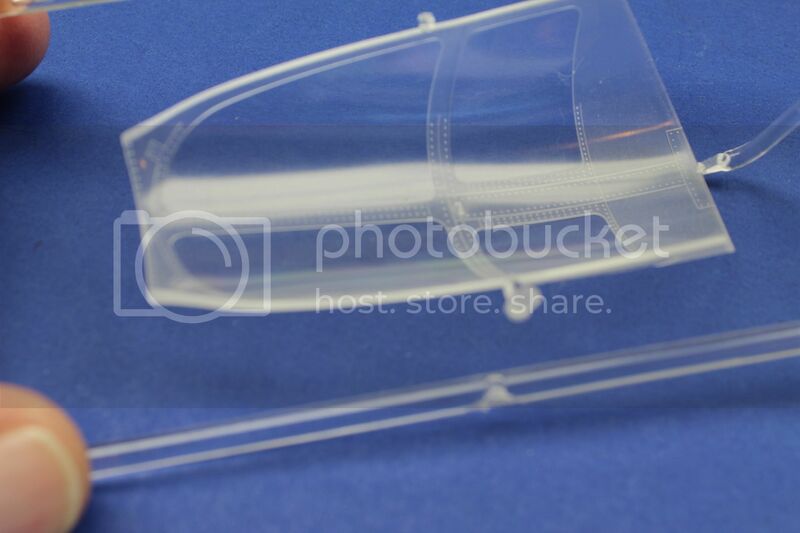 Plus another smaller boxing which contains the clear parts, a small set of PE and various more delicate parts such as the metal inserts for the gear strengthening and the rubber wheels. As you can see from above the box is indeed quite packed with plastic to the brim. Mr. Hobby, Vallejo, Model Master, Tamiya and Humbrol. With having Mr. Color accommodating all paints available in their catalog. I did a bit if digging around in my paint stash and would say they are “close but no cigar”. As most of you know Mr. Paint out of Slovakia do a full range and are the ones to get should you want to get a much better color match. As with all discussions regarding accuracy no paint line will be exact and right on the money, but doing a bit of test spraying with Mr. 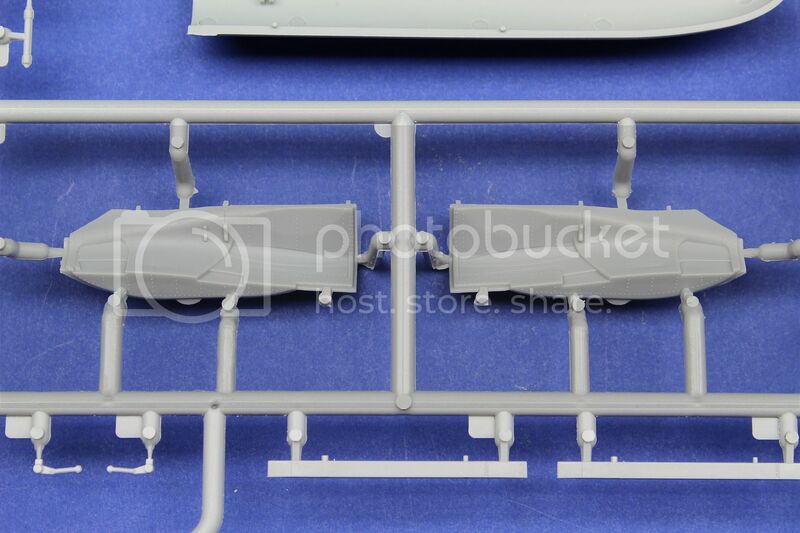 Paint (depending on using a Black Base or lighter Grey or White primer color) these make the best match possible. 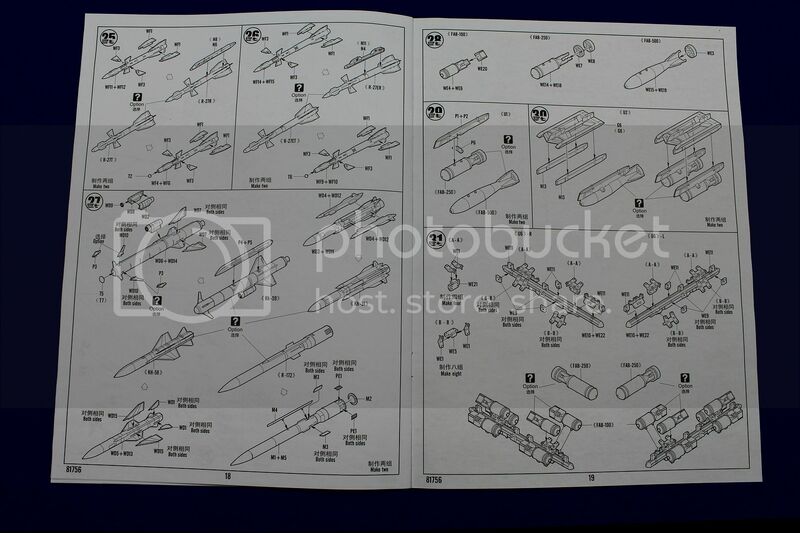 Call outs on the extensive weapons being included. As many have seen there have been quite a bit of discussion surrounding the inclusion of this weapon set. 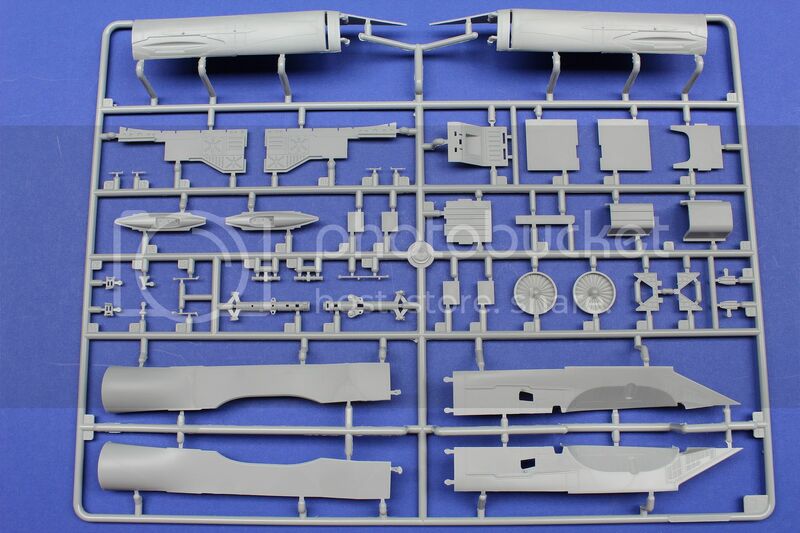 It is interesting to me that there appear to be two camps in the industry, one believing to provide as an aftermarket or detailing set to get should one choose to do so, Tamiya and Hasegawa come to mind rapidly. 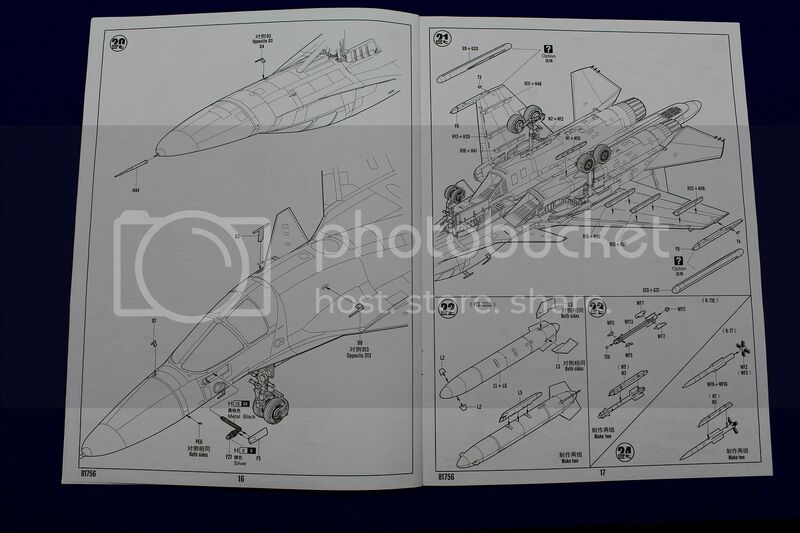 It still undetermined if Kitty Hawk will include the ones they depict on their website/Facebook pages. 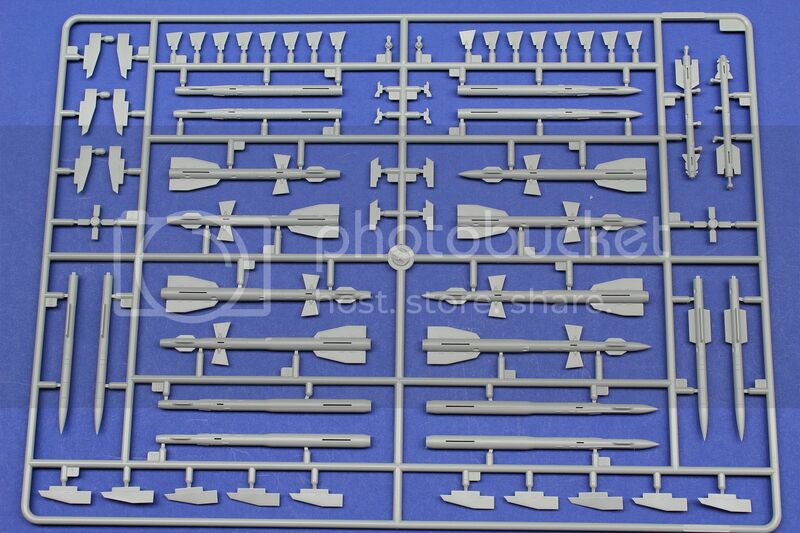 If you check any of the discussions on those manufacturers you will see a dislike of various modelers quick to the draw questioning why there are no weapon sets available. 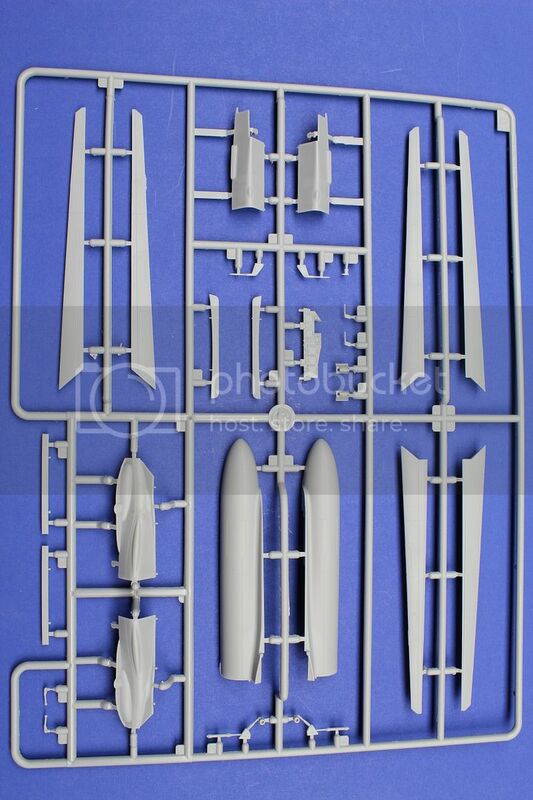 On the flip side when a manufacturer in this case Hobby Boss decides to include them there are discussions on the reasoning why and would potentially increase the overall cost of the kit. As much as I see both sides of the discussion, I personally like to see the weapon sets included (provided they are of good quality). 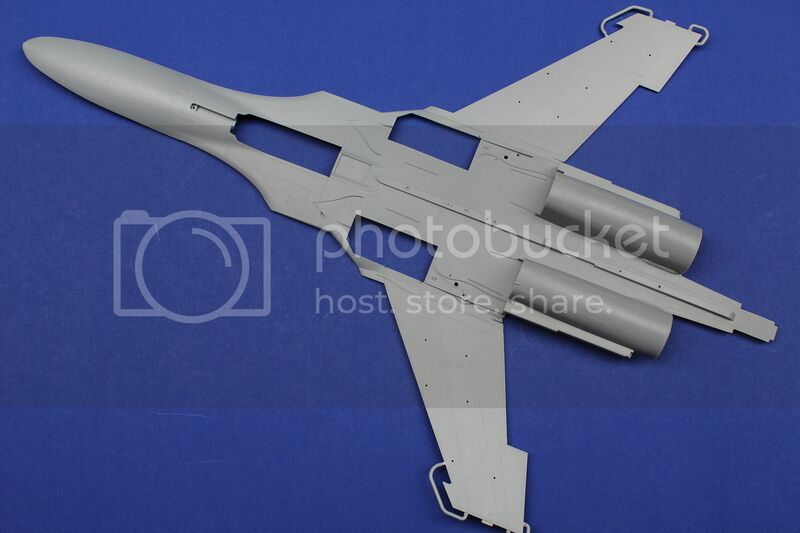 Especially given this subject that has some very specific to this aircraft (new) weapon sets not available elsewhere. 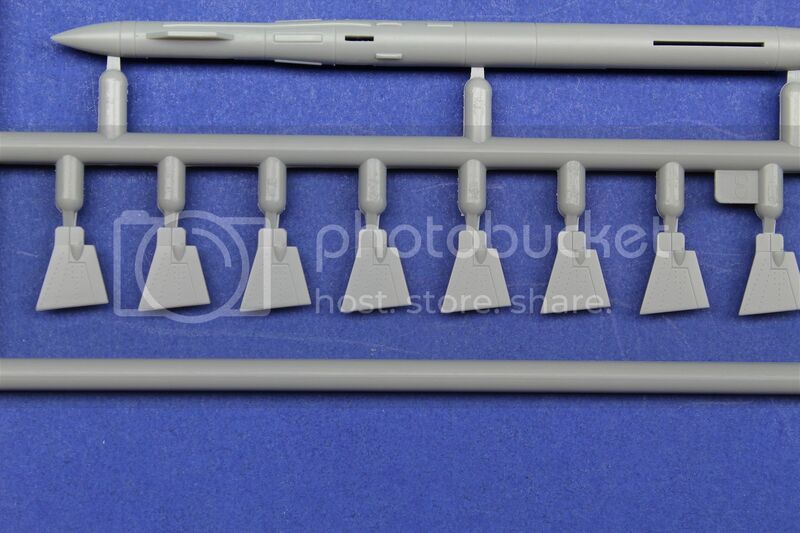 With that said, as you will see later on in the review it is highly important to have the specific pylons included as well, that are accurate and use full. 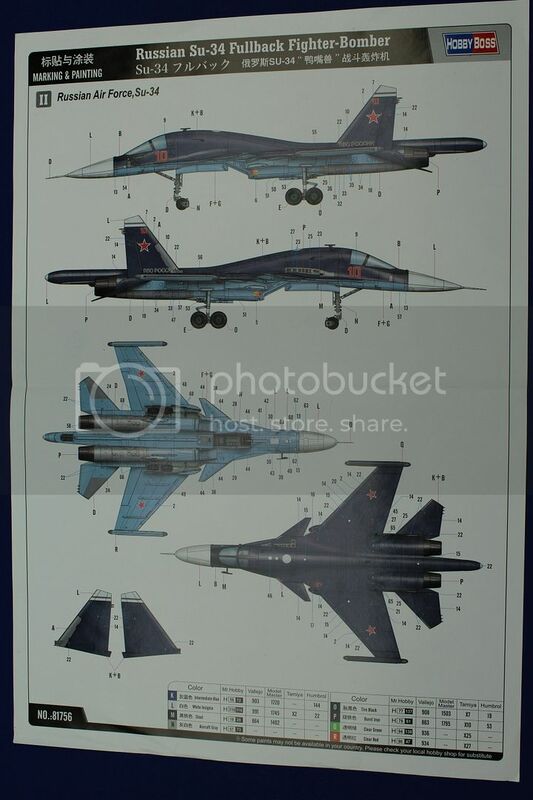 I am a Russian aircraft lover and any and all weapons that are optional or choice can be used on other aircraft that need some dangly bits. 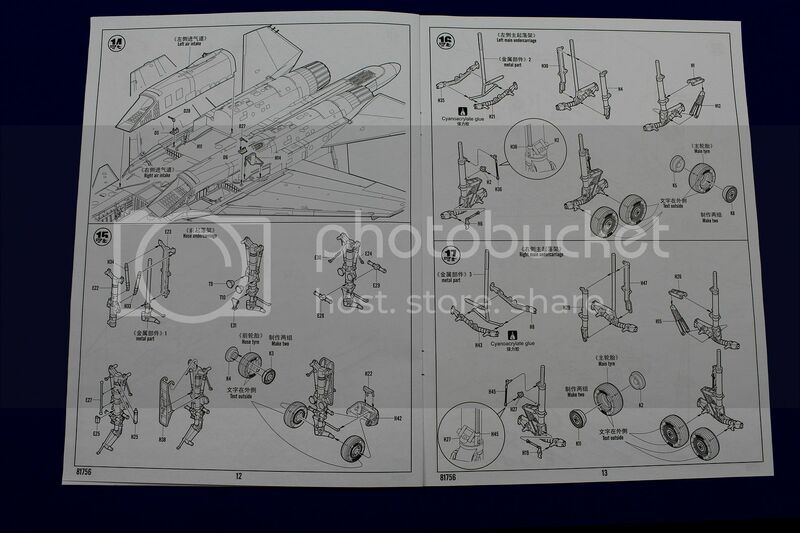 The instruction booklet is standard fare21 pages long with good clear drawings and in general quite a good order of how to assemble things. Most advanced modelers tend to chuck these aside and do their own order, but I do have to say these do look smartly laid out and easy to follow along. 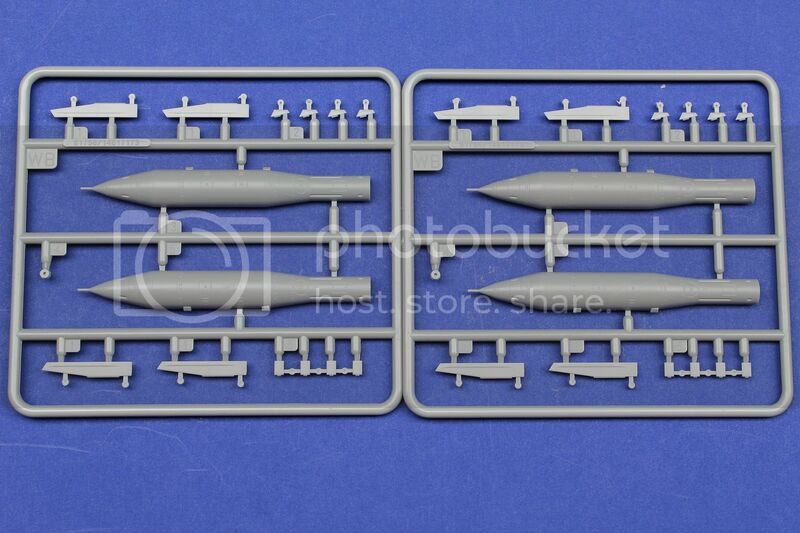 Here are the two very large fuselage halves. 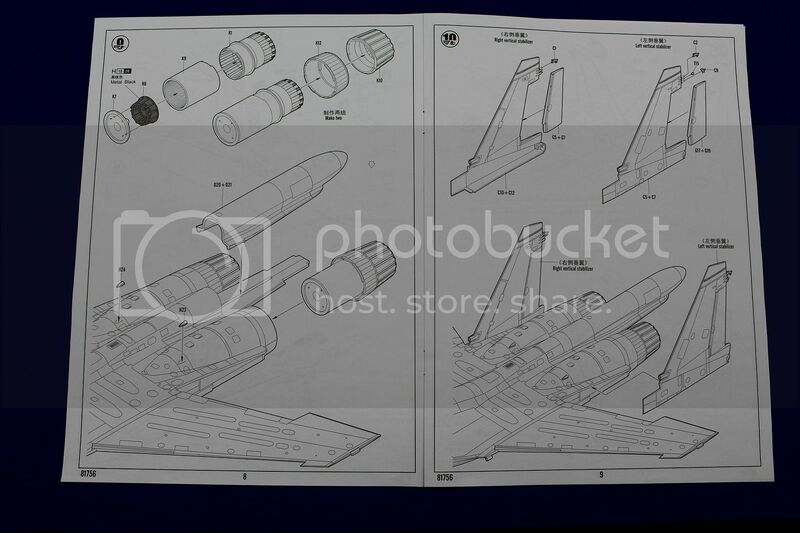 I do very much like the fact that they choose to continue the (SU-27/33) style way of breaking down the fuselage. It keeps the beautiful and very complex shapes and curves in tact without making things hard on how to build and hide seam lines. 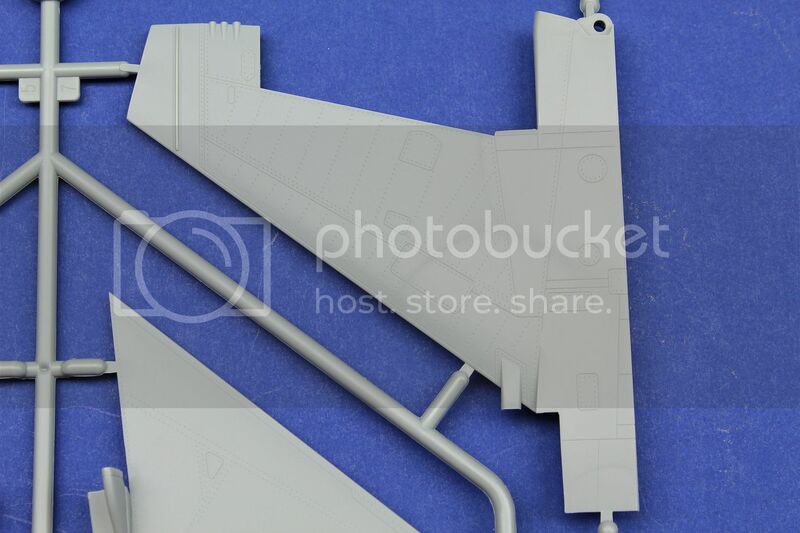 The lower wing tips are nicely protected with a bit of sprue gate surrounding them. As mentioned I had some minor warping on them. And I’ll repeat very minor which can easily be brought back into shape with a warm hand. 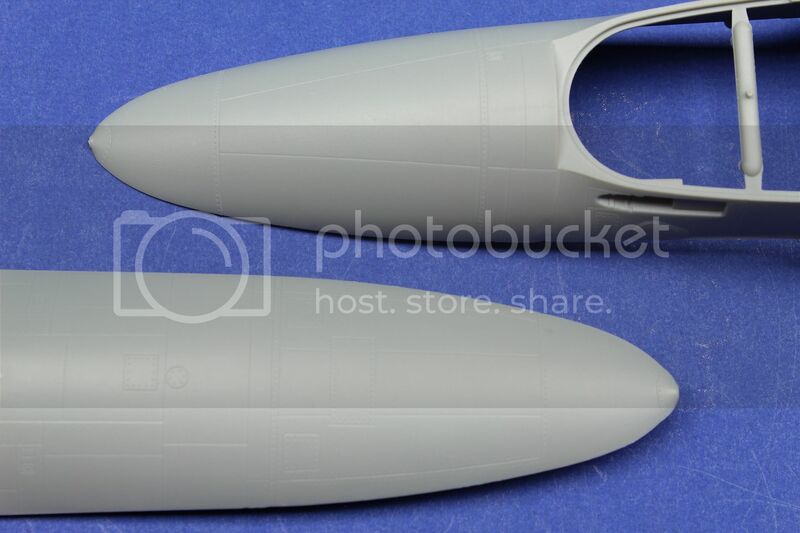 I already checked to see when placing the two halves together if anything gets pulled out of alignment such as dihedral, and wing tip differentials. Happy to report this is not the case. So truly nothing to worry about but did want to mention it. One thing that I would like to have seen is to have the pylon pre-drilled areas being optional. There are many different load outs possible and not all pylons or stations are “always” utilized. 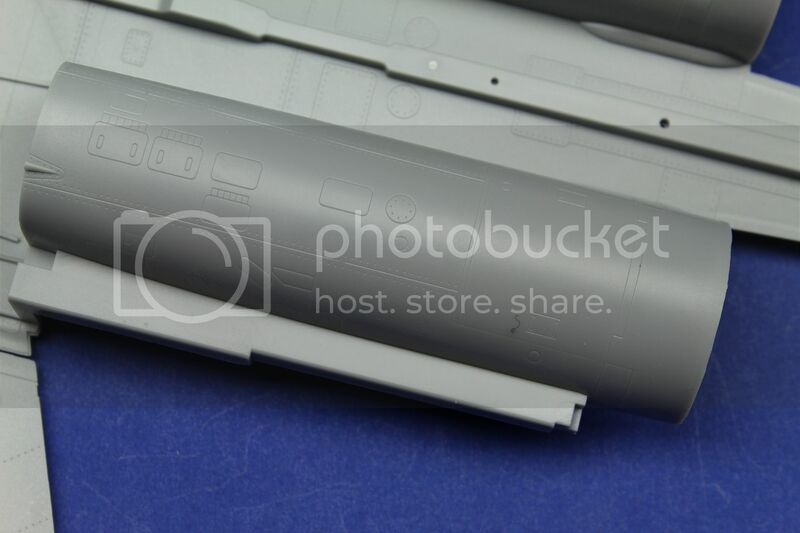 So having them blanked off with a slight depression on the inside of the wing to allow the modeler to drill out would have been a nice option to have. More plastic than the eye can see ! 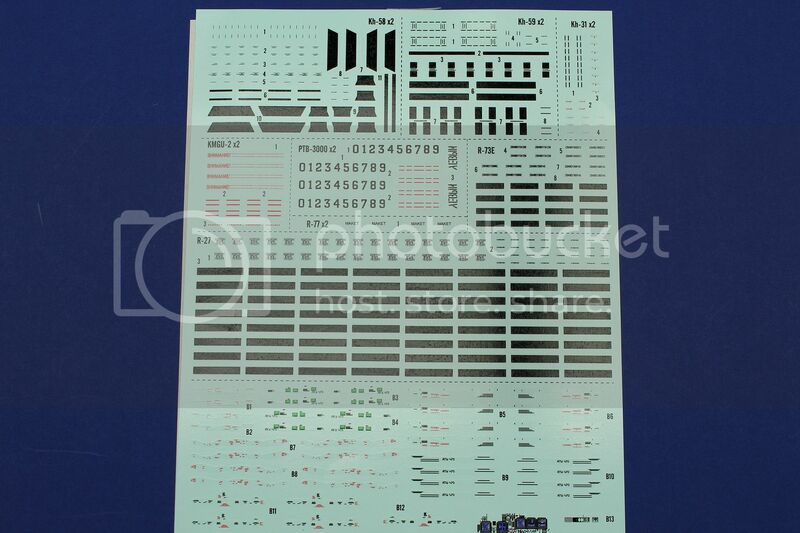 Here is the extensive weapons decal sheet, The black bands are for inert/practice weapons so choose carefully on what you plan to utilize or want to depict. Looking at the detail in the sheet the color saturation is good, the stenciling (even under magnification) is very small. Some of the ones I was able to decipher look good, but there is no one whom would be able to read these at normal viewing distances. 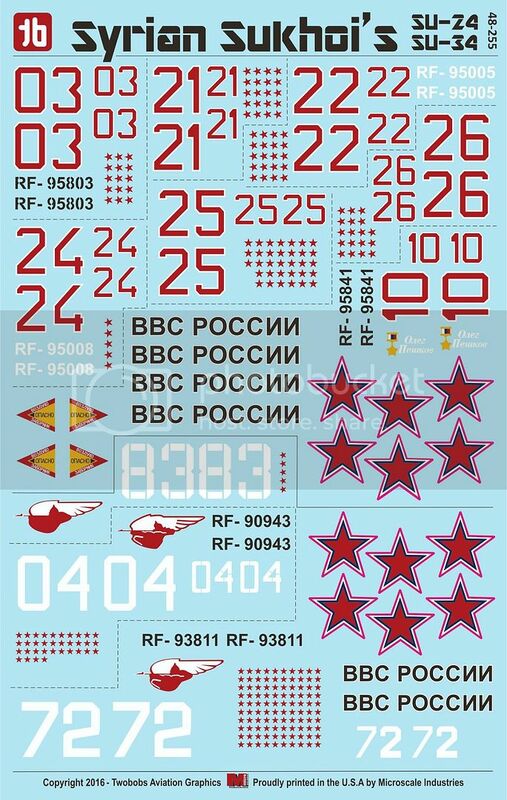 There is quite a colorful decal insertion for the instrument panel, which will do the trick for most of us as the cockpit glass can not be opened up in real life. Entry/exit is through the bottom front wheel well. 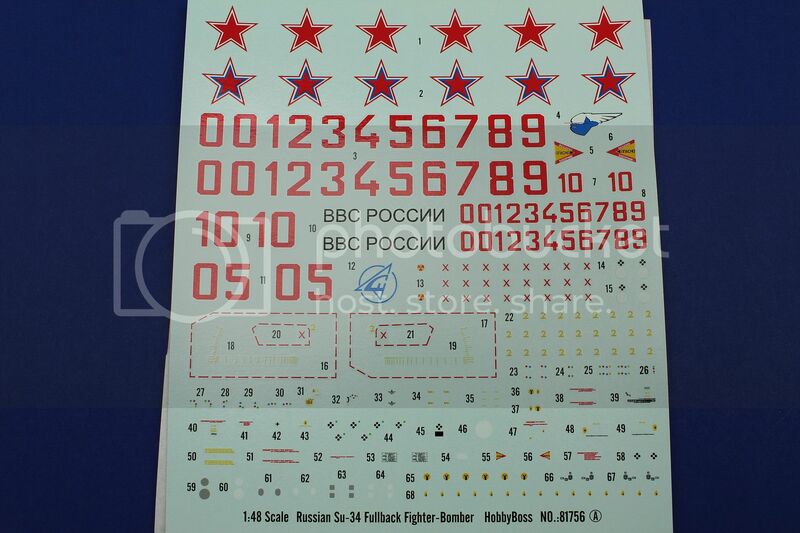 Hobby Boss and Trumpeter continue to have a slightly too light in my eye of the Russian Red Stars. In this rendition it also includes the more modern Blue Lined Red Stars. 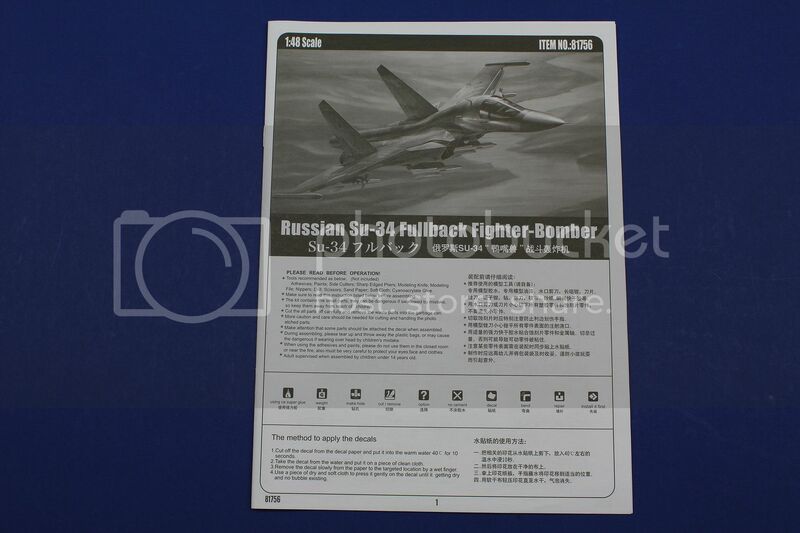 The Sukhoi design Bureau logo’s appear to be correct albeit a little under detailed. The Warning Intake stenciling is correct. 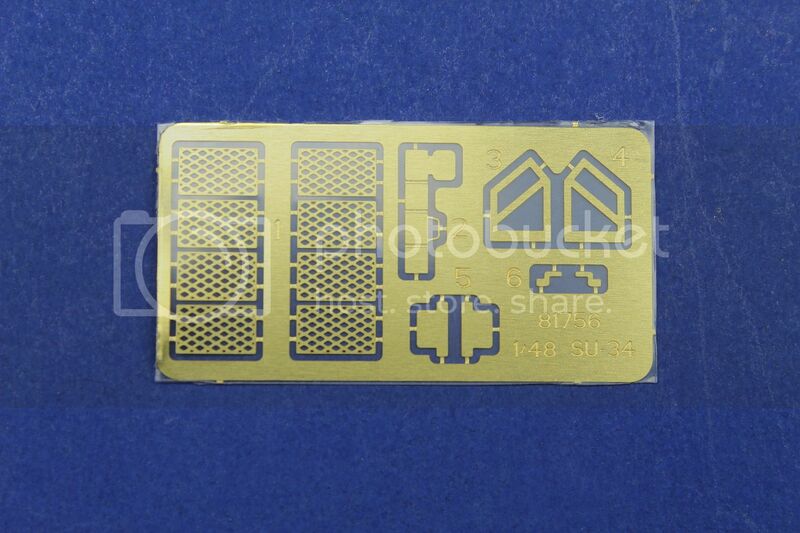 The No Walk outlines have very tight carrier film surrounding it and also where there are clear spacing it was removed thus resolving any troublesome spots with silvering. 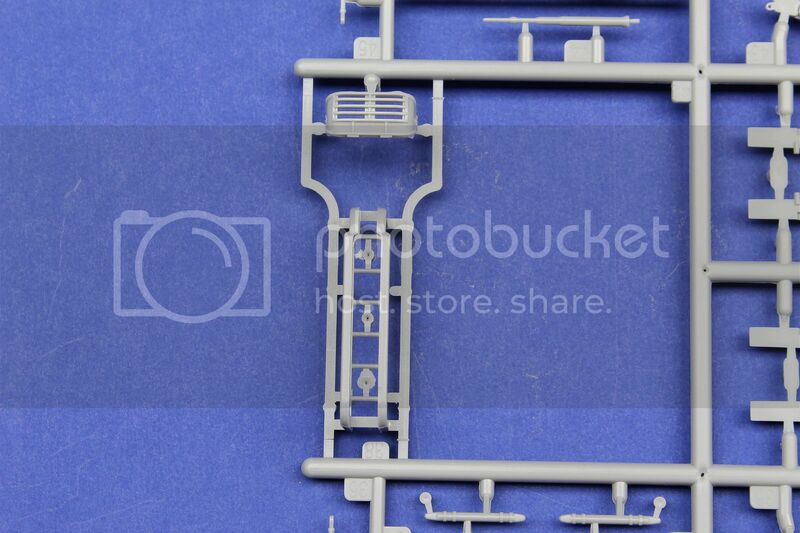 This sprue has most of the engine detail, no flash to be found, nice sharp detail throughout. 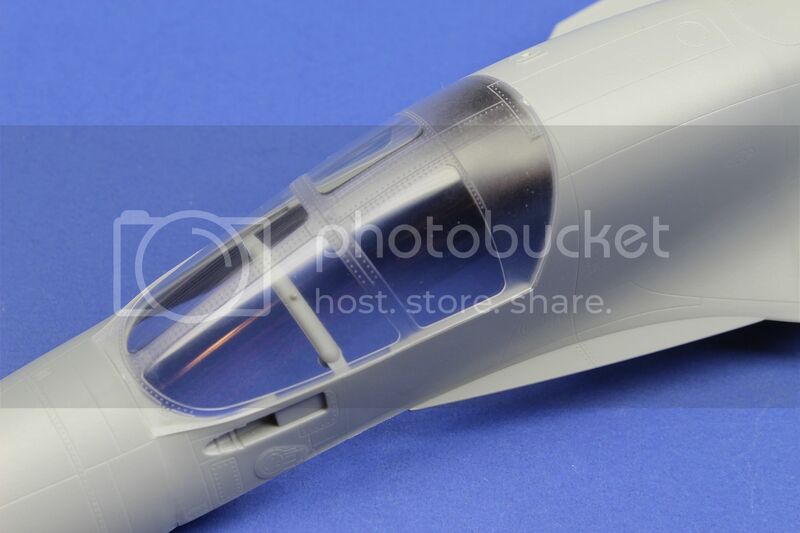 The nozzles do look quite nice, the internal combustion and fans could benefit from an aftermarket part if you are so inclined. 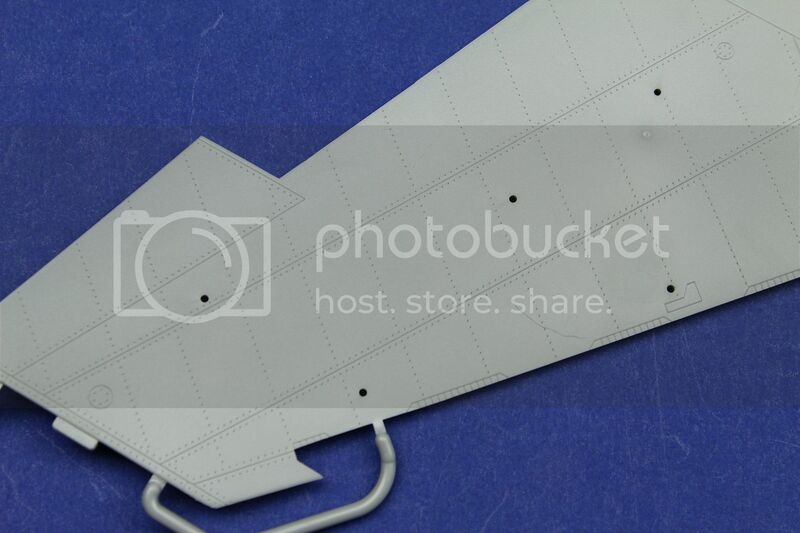 Some of the rudders and the winglets have excellent delicate riveting detail on them. 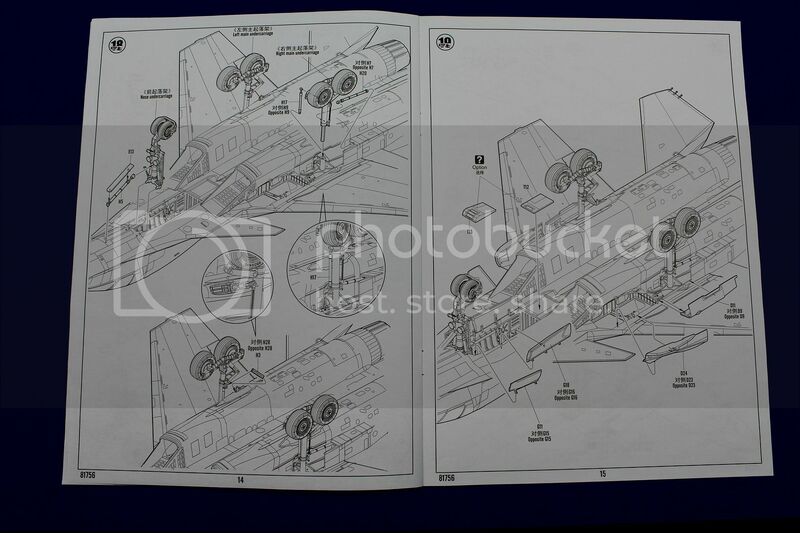 Checking some reference images, there are rivets present on the canards and appear to be in the correct placement/size etc. 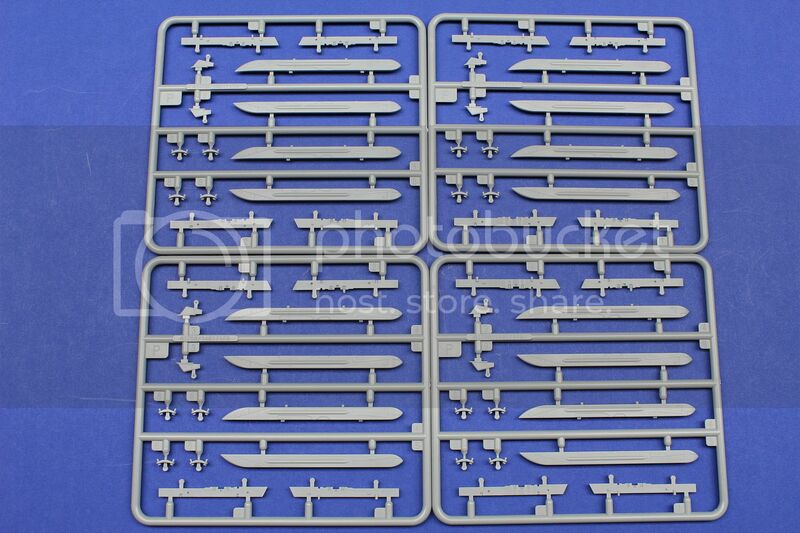 The detail is very fine and super sharp, panel lines are of consistent depth and do not fade around more complex curvatures. Some of the cockpit interior here, the detail is good although a bit basic for my taste. 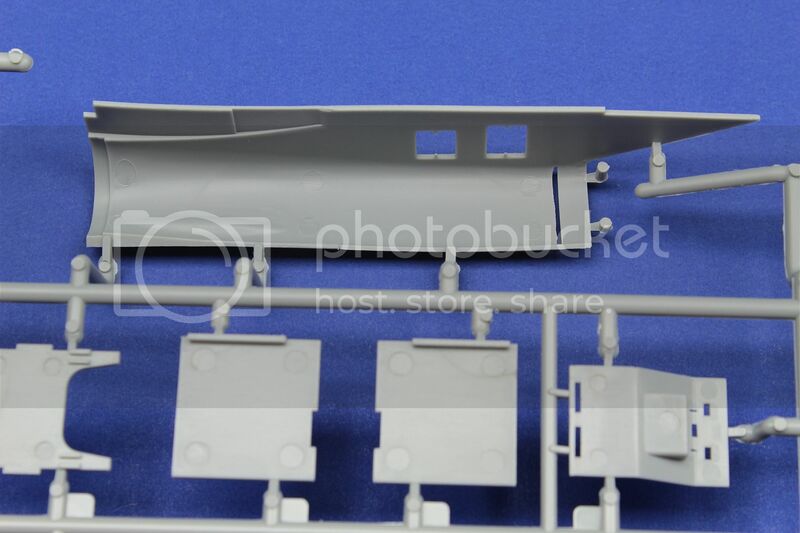 One should keep in mind that most of the cockpit is hidden as there is no opening of that large front window section. So you could get away with the detail provided in the kit. 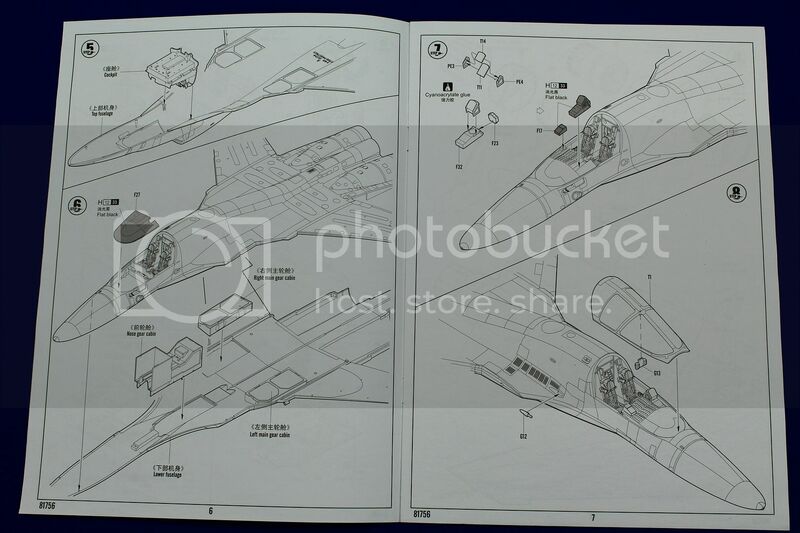 I am in hopes though that we do see at minimum some bang seats and perhaps an Eduard colored cockpit set to liven things up a bit. 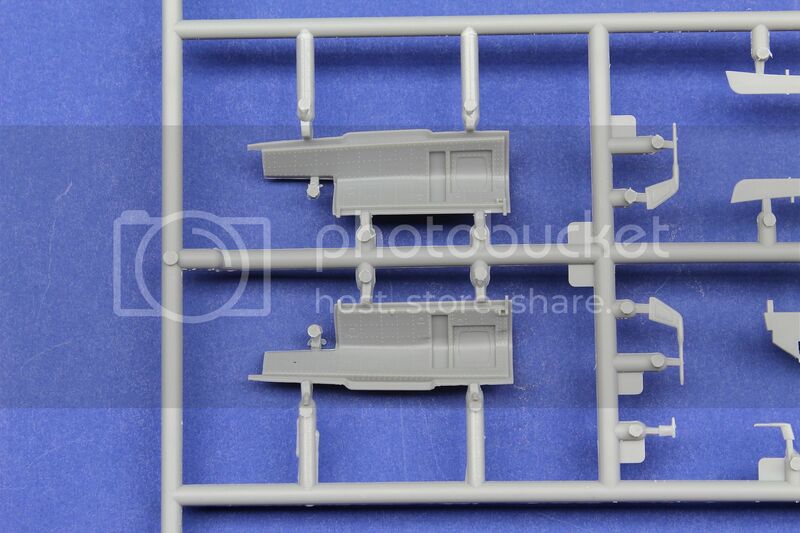 The characteristic “curtains” or blinds that roll down either side of the rear glass is not depicted and those of the purist might need to scratch build them. In most reference photographs they are pretty prominently on display. That massive stinger tail is well shaped and looks very good in the details provided. 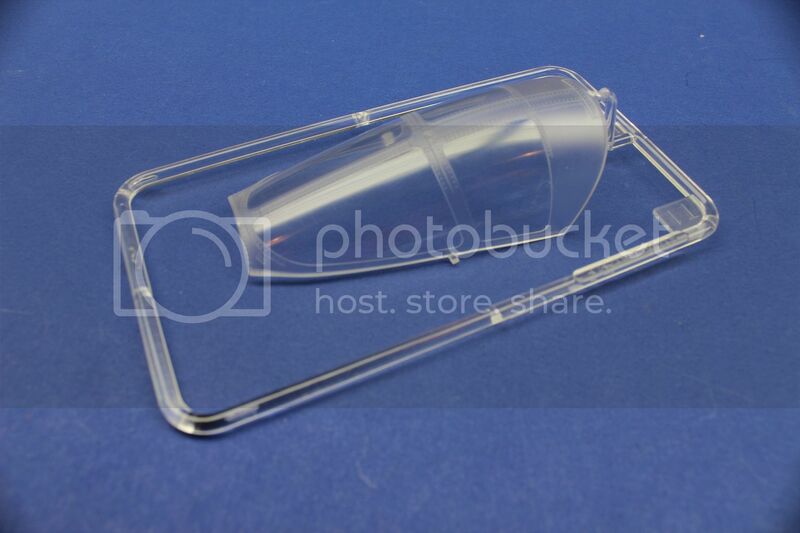 Gear doors are thoughtfully molded with no pin marks to have to deal with and the detail is sharp and clear throughout. 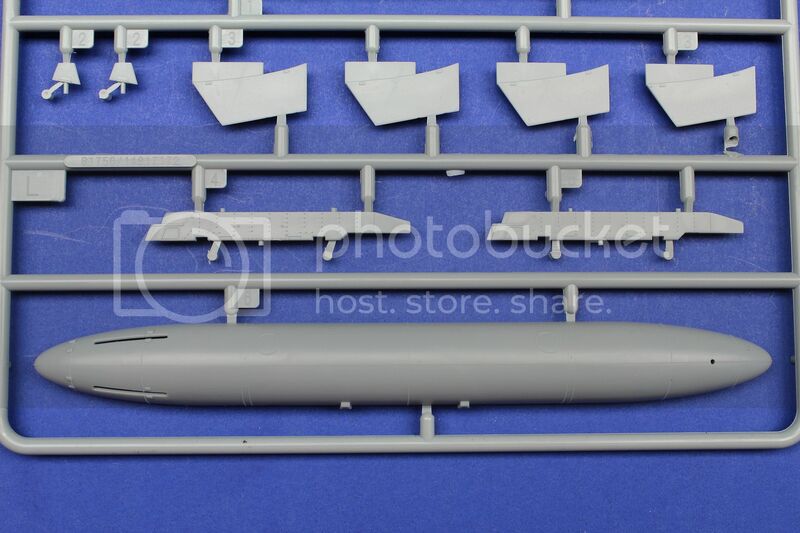 The various pitot tubes are available but could benefit from some aftermarket brass ones, pretty sure someone will bring them to market here pretty quick. Some of the gear parts showing the slot for the inner strengthening metal parts to go into. 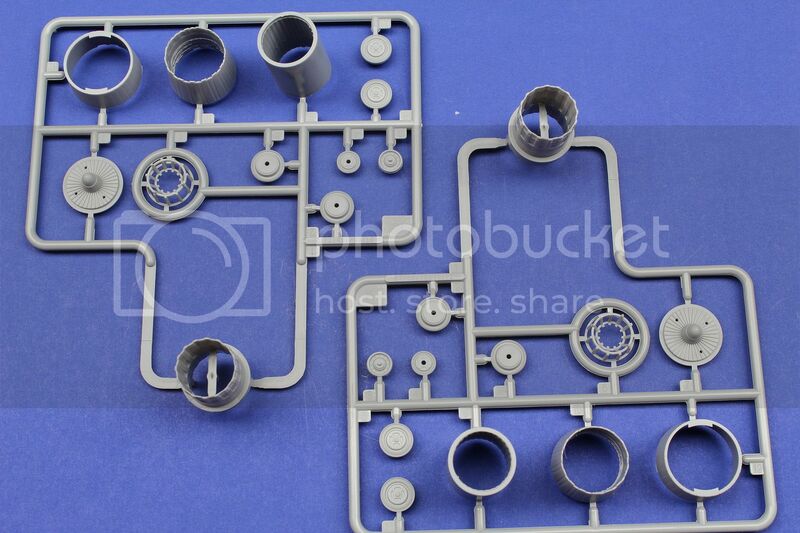 The mold lines on the gear is very fine which can easily be taken care of with a sharp light scrape of a blade once assembled. 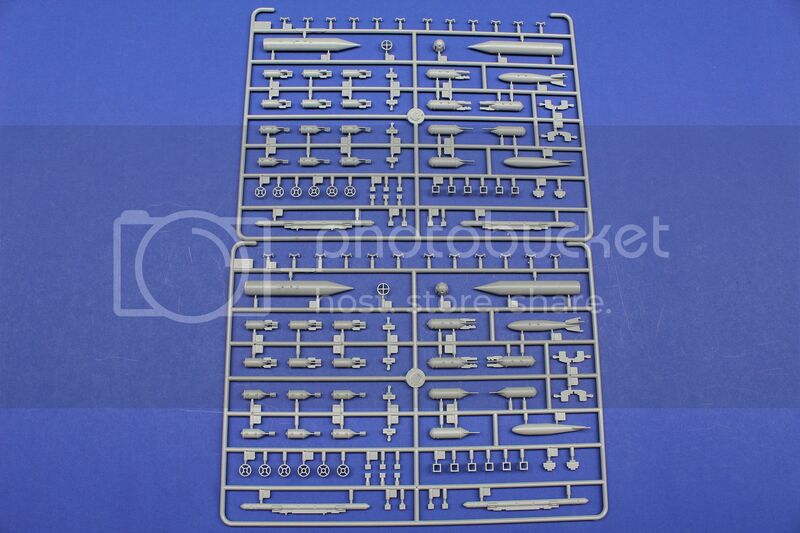 would love to have seen a PE part here OOB, I am sure we will see Eduard come to the rescue. 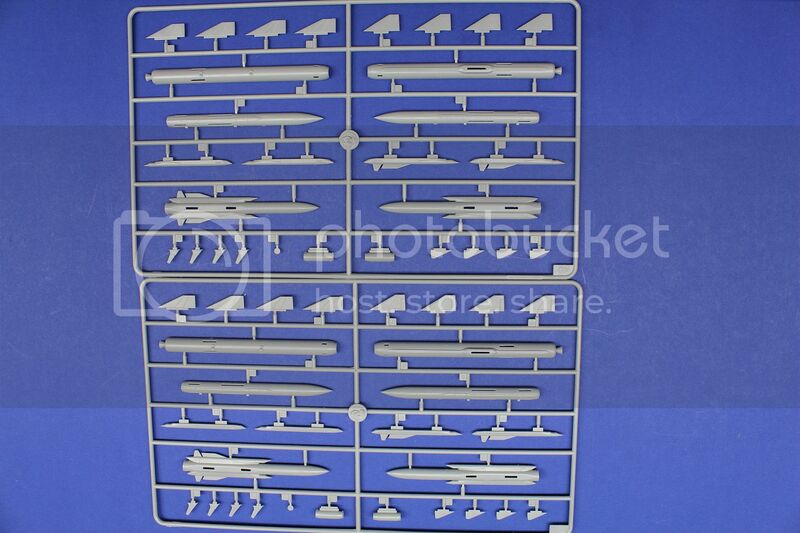 Also seen is the access ladder for the nose gear bay, a nice touch to have that included. 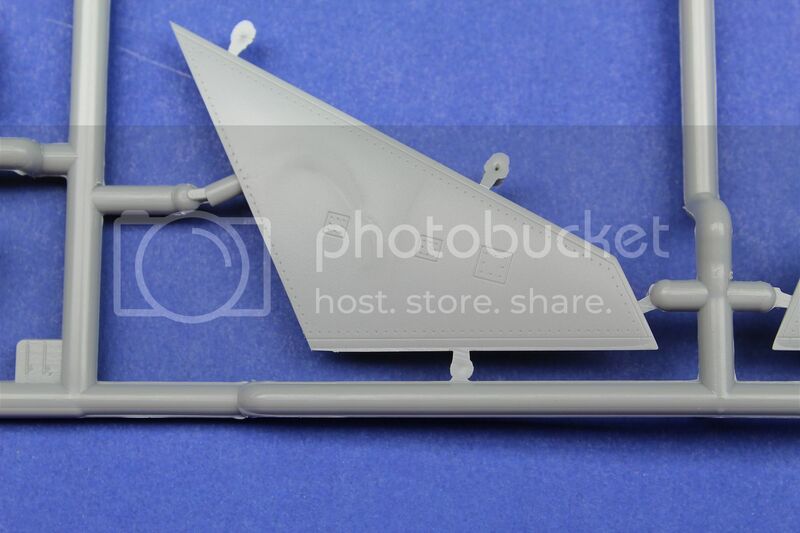 The main pitot tube is a bit of fictional approach I am afraid, there is no “bulb” type section, you can easily shave / sand that off and already have a better representation. Or wait for AM. 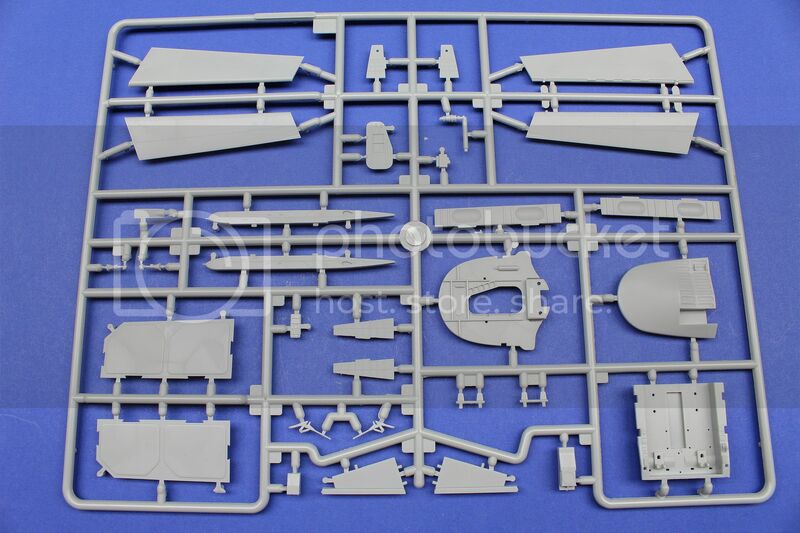 Main intakes are nicely detailed throughout and have very fine panel lines, which again run consistently from end to end, no fading around corners or 90 degree molding. 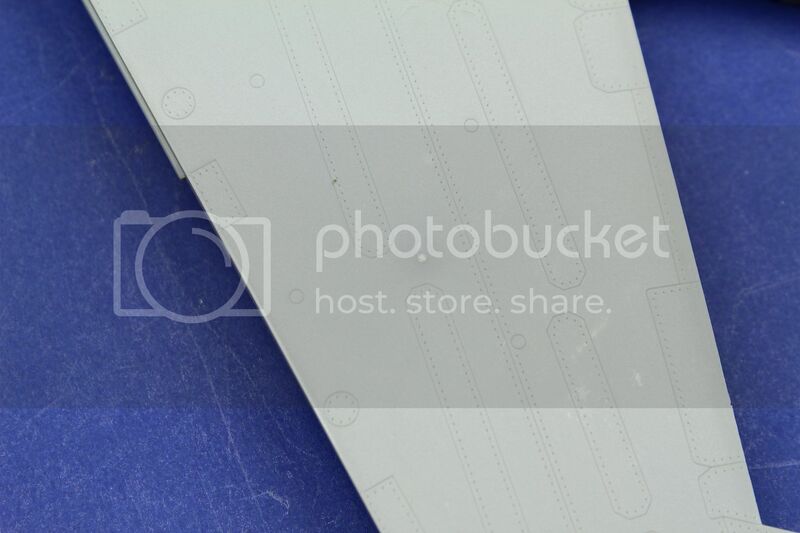 Riveting is consistent and no stress marks seen in the plastic. 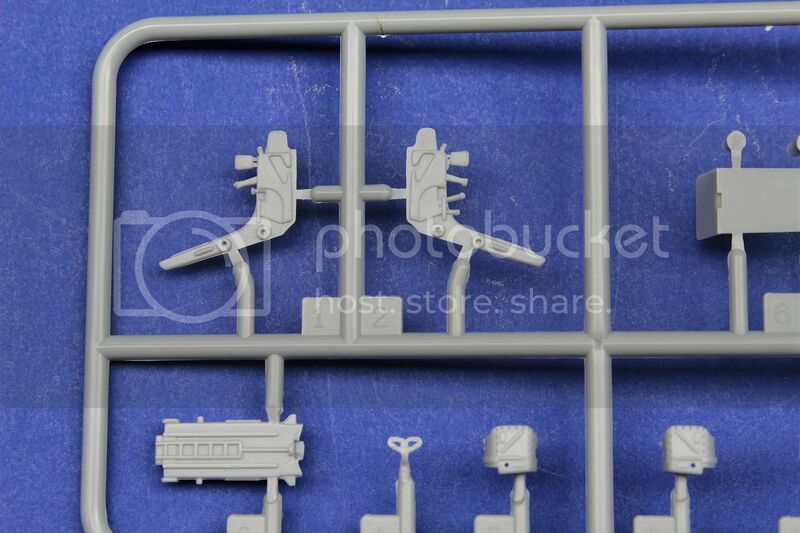 Some lovely detail on the inner main gear wheel bay sections. 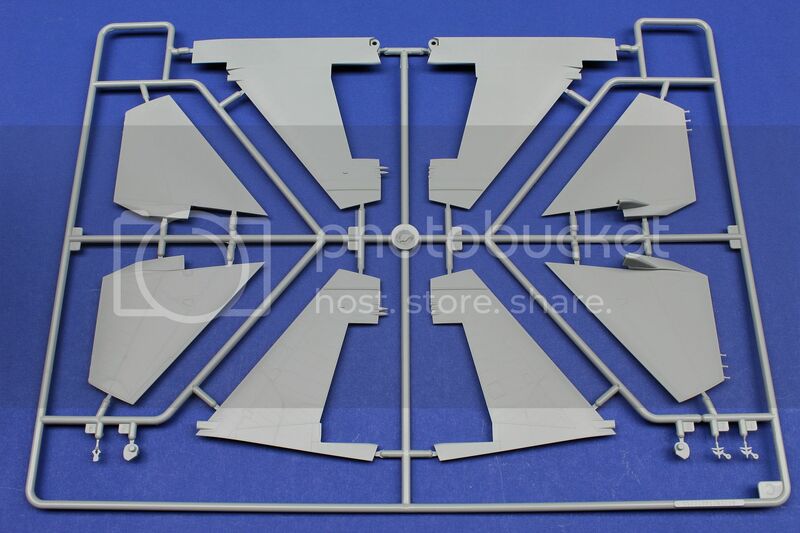 The waste gates are well represented in plastic, a bit of weathering wash will make these stand out nicely. Perhaps a bit of picking here, but would have loved to have seen some fine PE here instead throughout. There are two section that are done that way, why not do them all? There are some pin marks on the inner part of the intake. 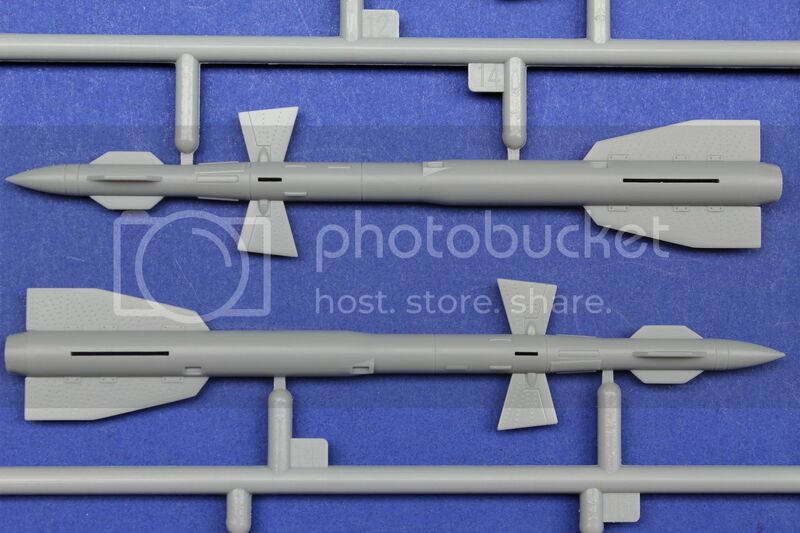 They are quite shallow and looks like they are not going to be too difficult to get rid off ads you have plenty of elbow room here before assembly. 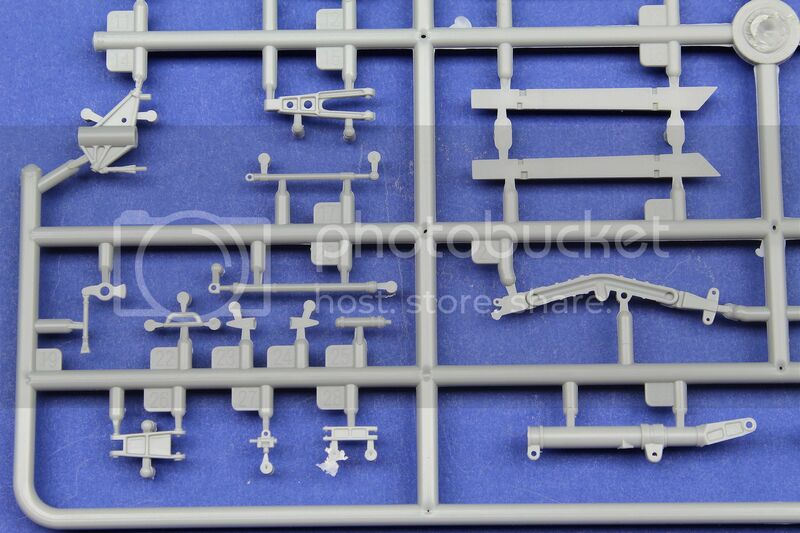 A little bit of home brew plastic sprue filler and sand will make quick work of it. 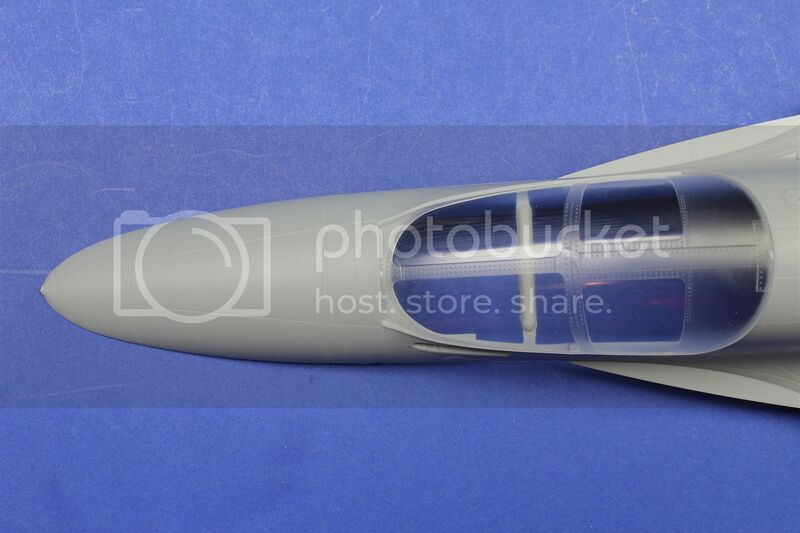 The fins and associated elevons, all nicely depicted no flash no trouble seen here. I do like the fact that the outer panel to the two fins include the fuse sides. 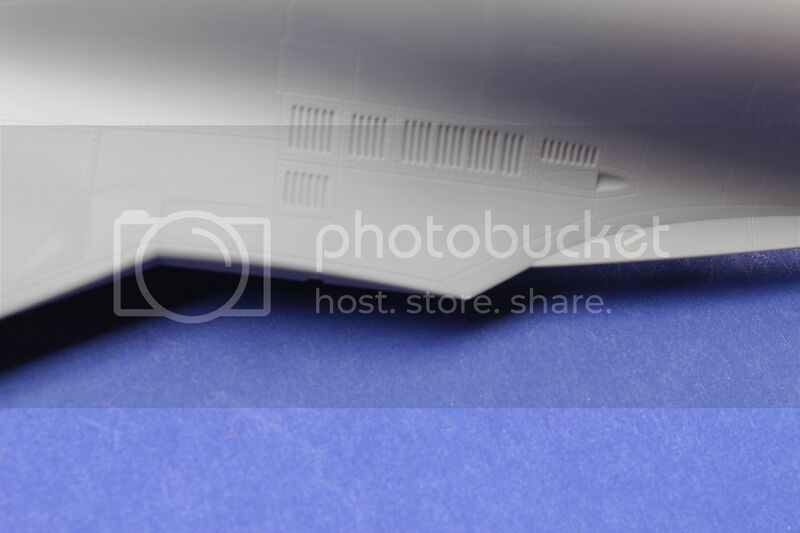 This is always a troublesome area for us modelers to fill the clam shell seam. Doing this type of engineered approach will hide that trouble spot completely. Here comes that “extra box” lets have a look inside…. 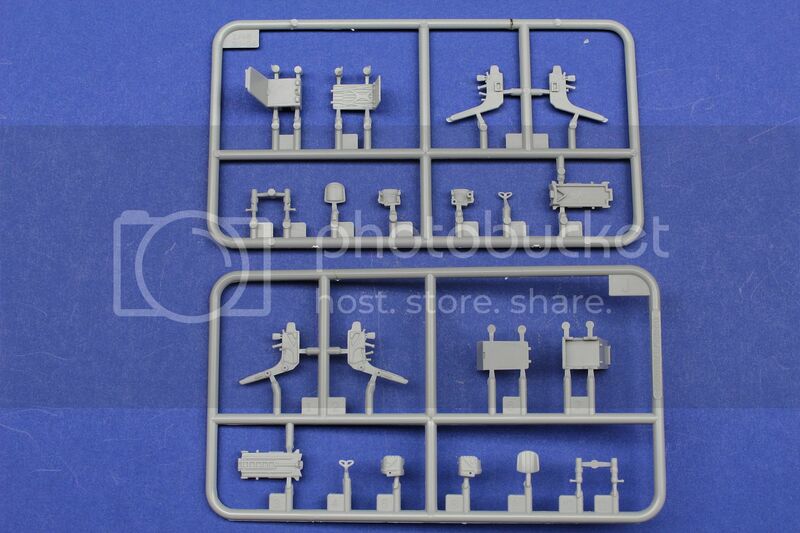 loads of pylons that look nicely detailed and accurate in shape, including required sway bars etc. No flash to be found all panel lines and riveting again nicely restrained. 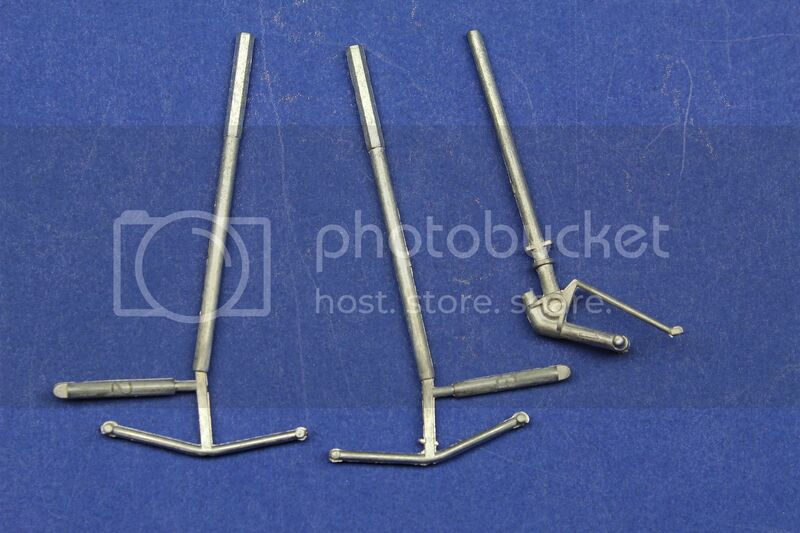 Nicely molded for OOB sway bars. 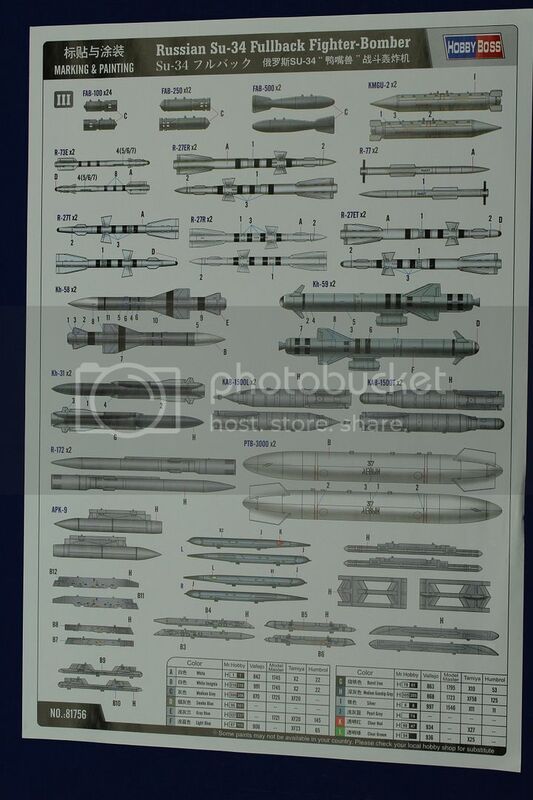 More of the general weapons/pylons for Russian Aircraft. 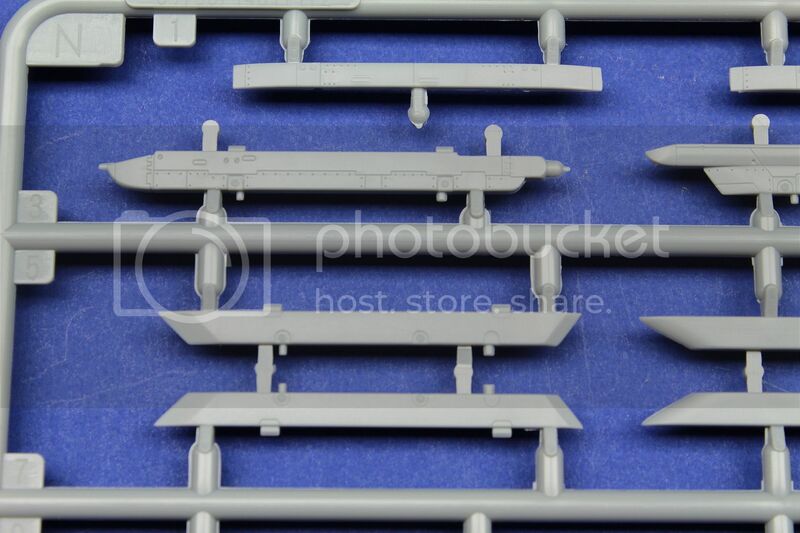 Here are the EJ seats, and do look quite nice for OOB. Will be doing a comparison to currently available reason ones as I am curious of there are size differences and clearance problems to worry about should you go that route. Some nice detail on the sides of the bang seats. 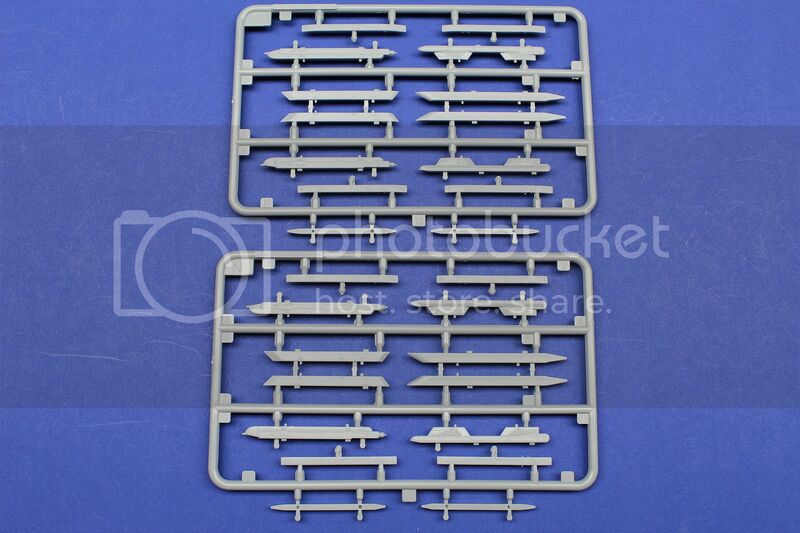 Clear sprue for some of the weapons seeker heads, all look quite clear and distortion free. The metal strengthening innards for the main and nose gear. 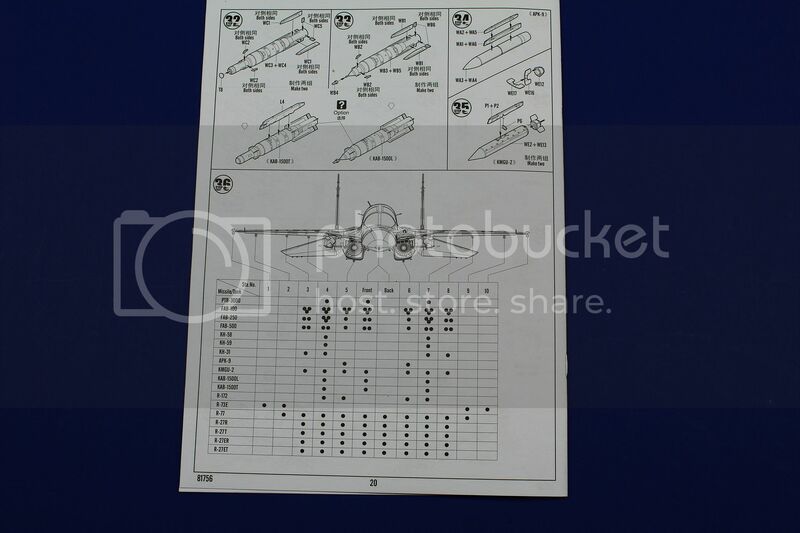 My one main gripe, and this is for anything rubber tires in aircraft kits, they are of no use at all, at minimum we should get the plastic variety included in the box. But these look like truck tires and are way over scale, the sidewall lettering appears to be incorrect as well. 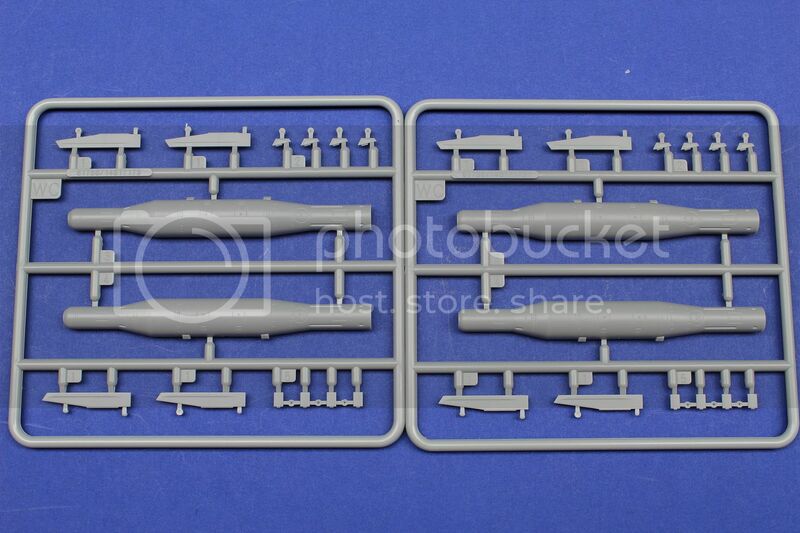 Luckily, Fisher Models Resin, and Red Star Models will be producing and bring to market correct (sagged) wheel sets. 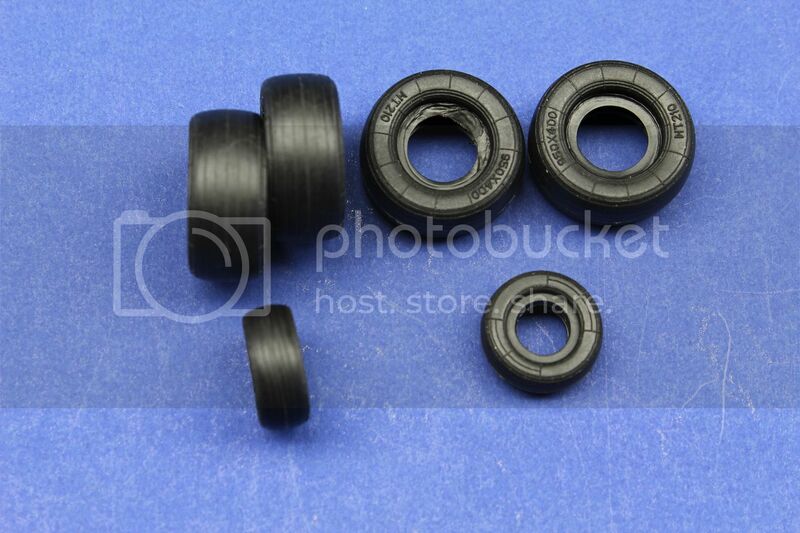 They will also correct the wheel hubs as the kit is quite bad. I am sure Eduard will also compete in this are with their excellent brassin range. A very small PE sheet. 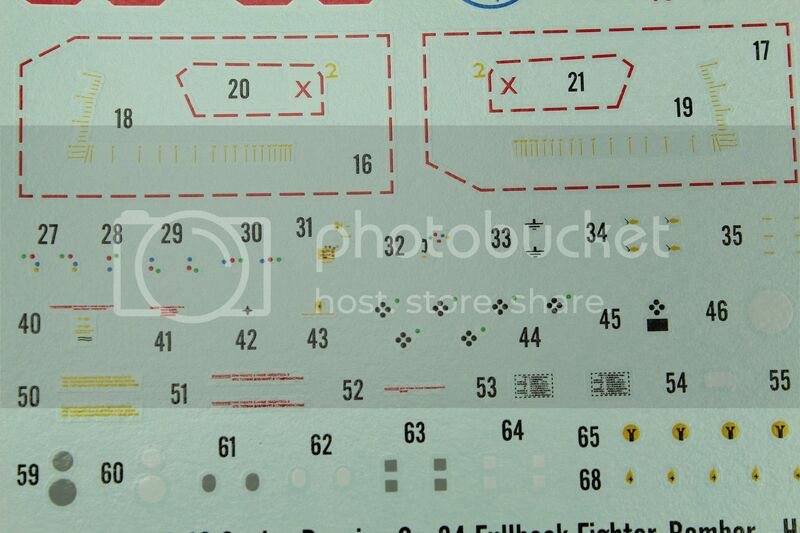 As mentioned throughout the review there are quite a few places where Hobby Boss could have extended the detail quite easily. 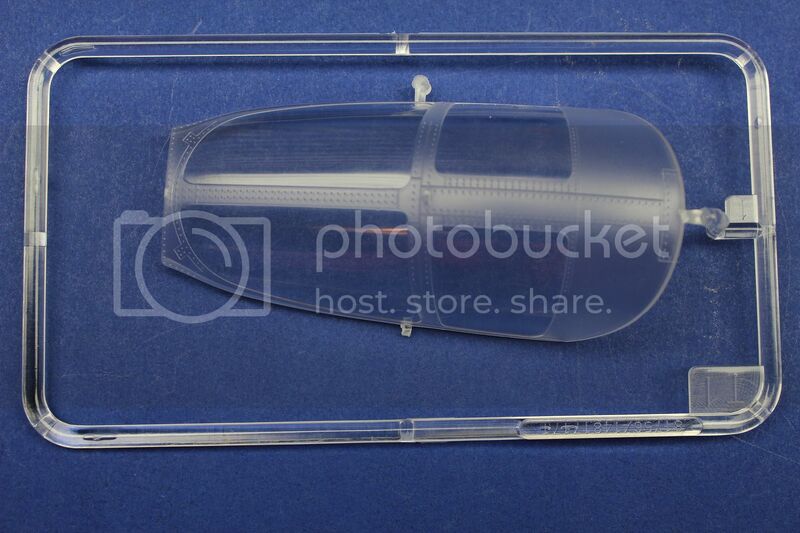 It is a shame to have missed that opportunity to offer it OOB. 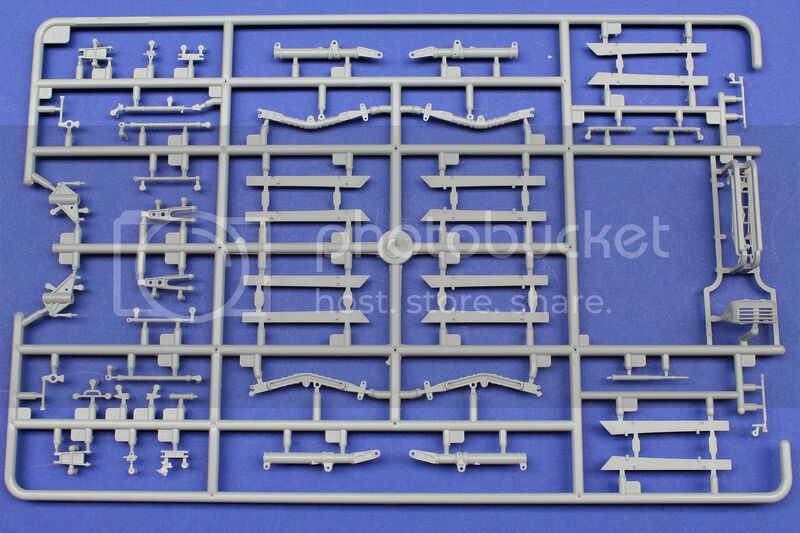 I do not like to see one sprue gate entrance and having it “dangle” like this, there were some slight stress marks on where it was attached. 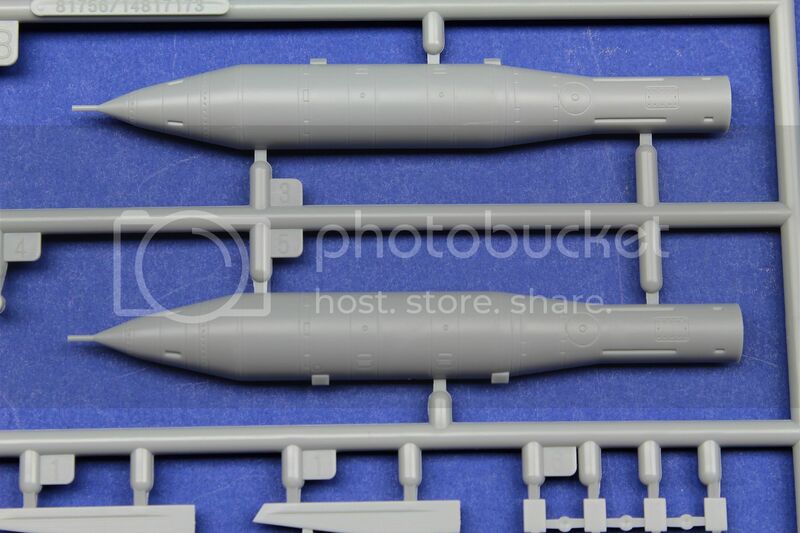 I’d like to have seen ala Eduard / Kitty Hawk / Tamiya a brace that goes over the top and under the bottom of this delicate piece to not only protect it during shipping but also allow for the plastic injection process to have time to flow through the mold. I was able to see (although under 2x magnification) some slight distortions and some slight stress marks. 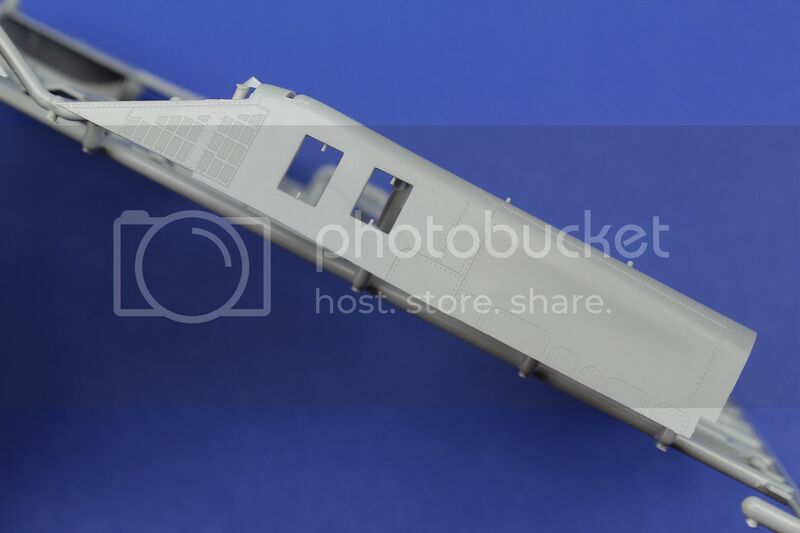 I was able to polish all of it out with some Tamiya polish and a high gloss Blue/White or Green/White shiner / sander from Flory Models range. Also carefully clipping the part immediately off that single almost broken gate will save the part from further damage as it awaits its turn to be build ! 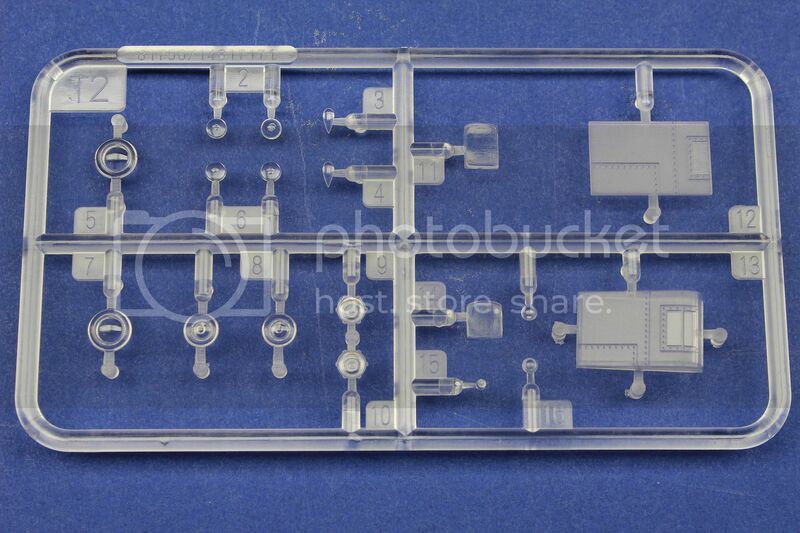 I know HB can do a very good job with clear parts as was attested to in my 1/32 P-61 which is some of the clearest clear parts ever seen. As a side note it would have been nice to see HB add some mask set here, quite easy to do and would have added to the overall satisfaction / value for the money here. Hard to tell in this image but the very faint stress arks are more on the inner than on the outer side, fear not as it can be remedied and easily cleaned up though. 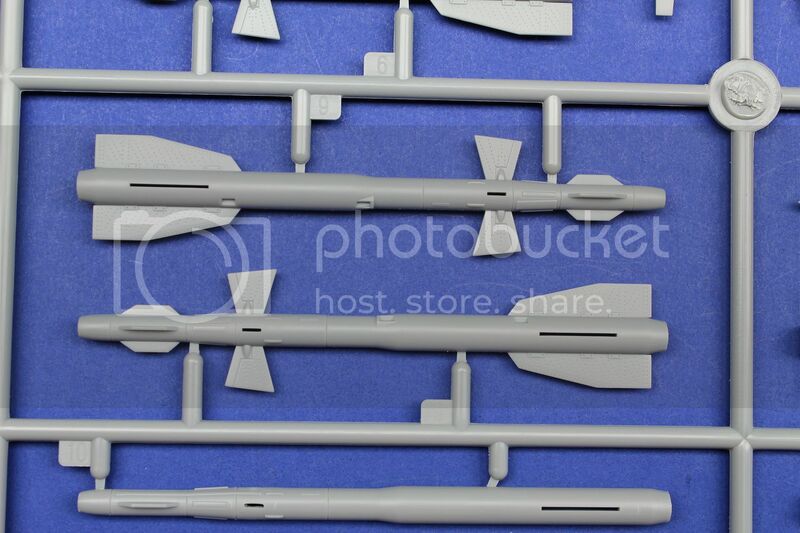 More weapon sets with separate fins that do look quite nice, perhaps not quite in the real of GWH slide molding but quite acceptable. 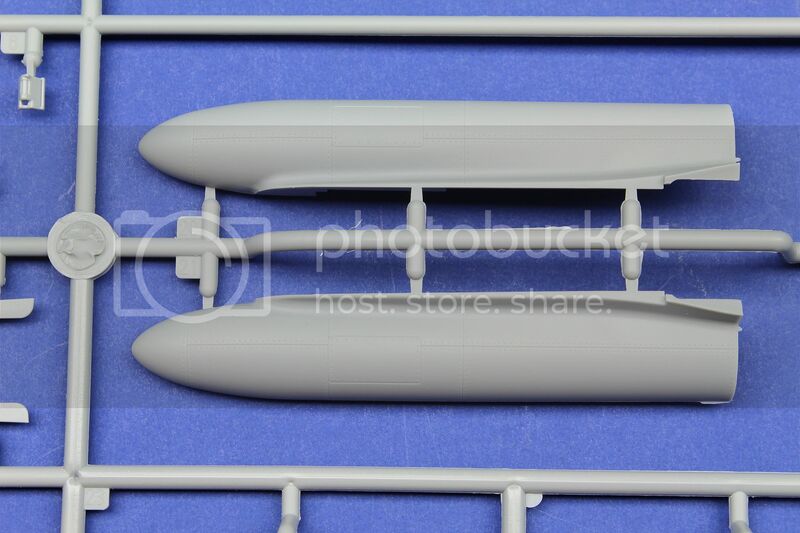 The large ferry tanks are accurately depicted with raised and sunken panel lines. 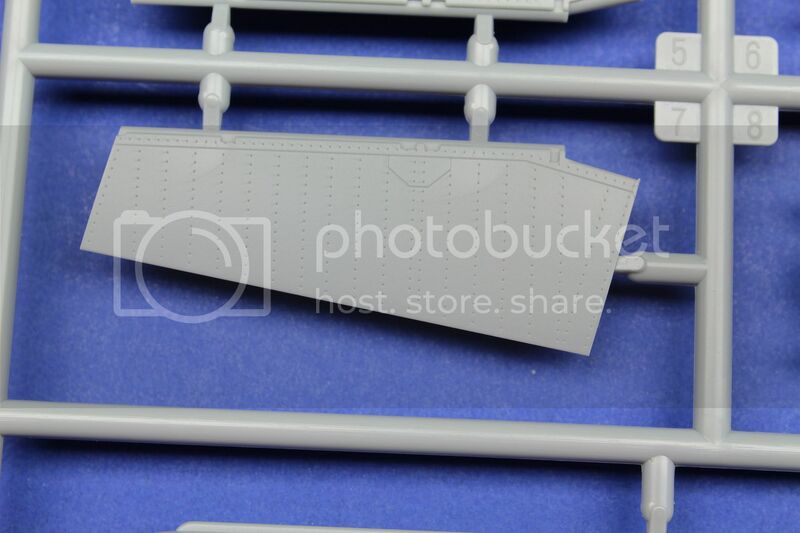 There are two “pips” sticking out on the top and bottom wings that will need to be carefully removed with some light light sanding and not affect the gorgeous panel rivet detailing. 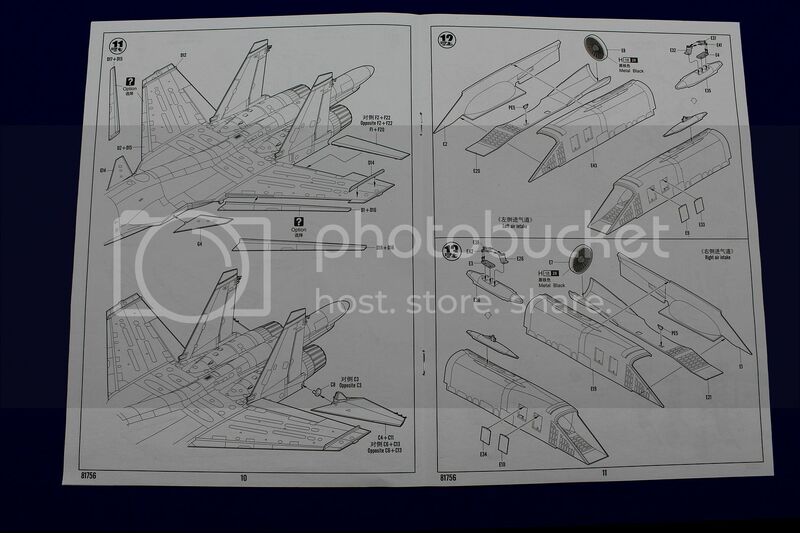 For those of you whom have been following the Nose Gate discussions, here is direct overhead image. 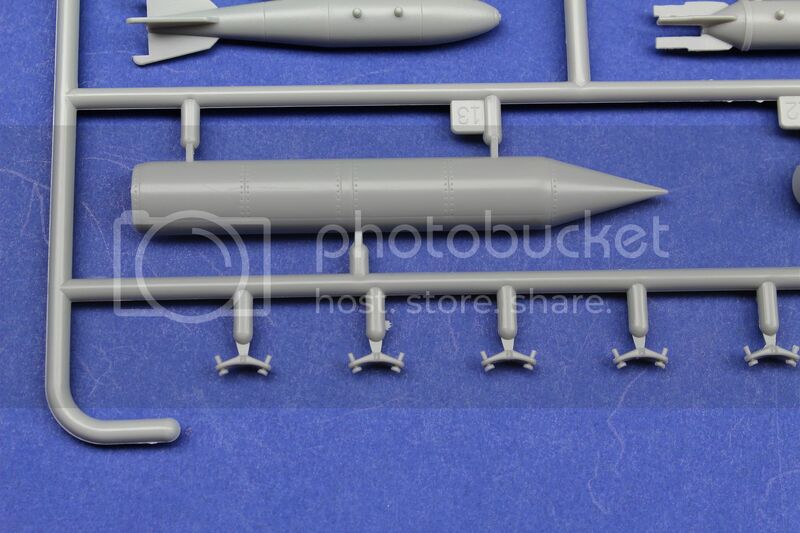 To be honest there is a very slight tapering that is missing and it will be interesting to see how Fisher and Red Star are going to address and engineer the grafting of the resin. 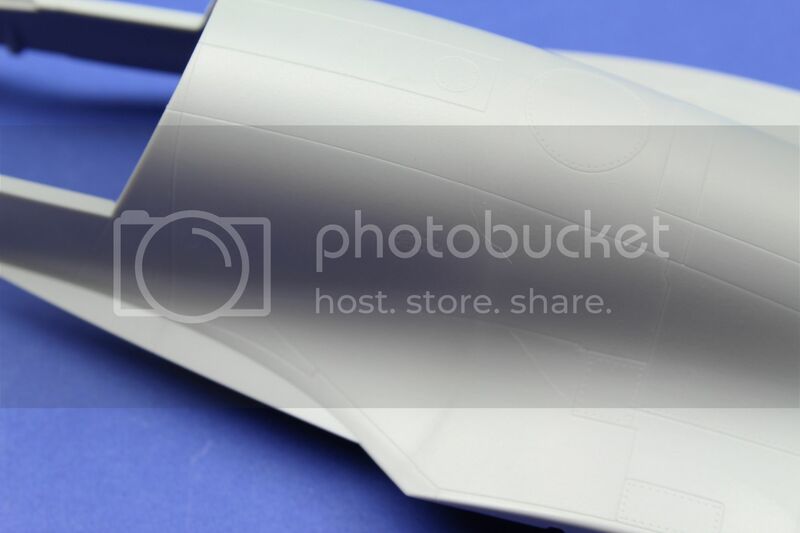 Interestingly enough as much as this has been discussed regarding the panel lines on the nose area, they can easily be sanded smooth I you do not want to spend or wait until the resin correction is available. 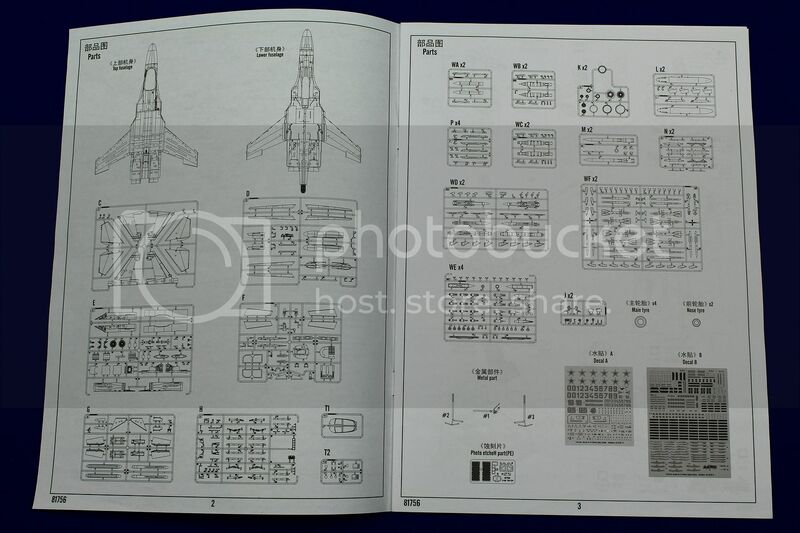 I do have seen several “variants” that do have some sort of panel lines, but nothing like what HB tried to represent. In addition I did find a very interesting belly shot of the nose depicting what appears to be three circular camera windows….. Some excellent very sharp detailing around complex corners no fading or issues to be found well done ! 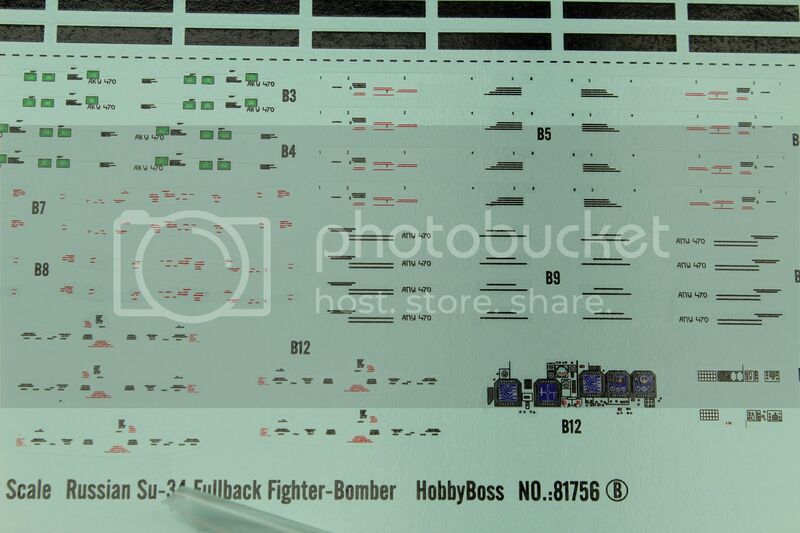 Another area where I think it would have been nice to get some PE inserts…..
For those of you interested in some conflict specific combat aircraft Two Bobs has announced they will bring out a decal sheet. It is planned for release in January. Glad to see a much more vivid Red Star set included as well. So when all is said I am super happy seeing this particular release, yes there are some issues (which kit out there is perfect), plus there would have been some easy gains with additional PE and a mask perhaps. Overall I love this offering and will be starting this soon. 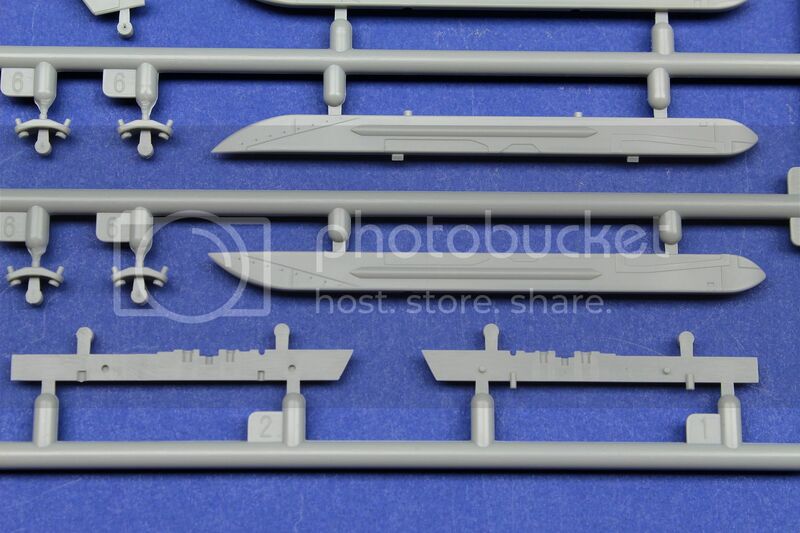 We are all super lucky to have another offering coming to market here very soon from Kitty Hawk, which depending on if they stop opening panels and including engines that can not be seen I will purchase just to build and compare. 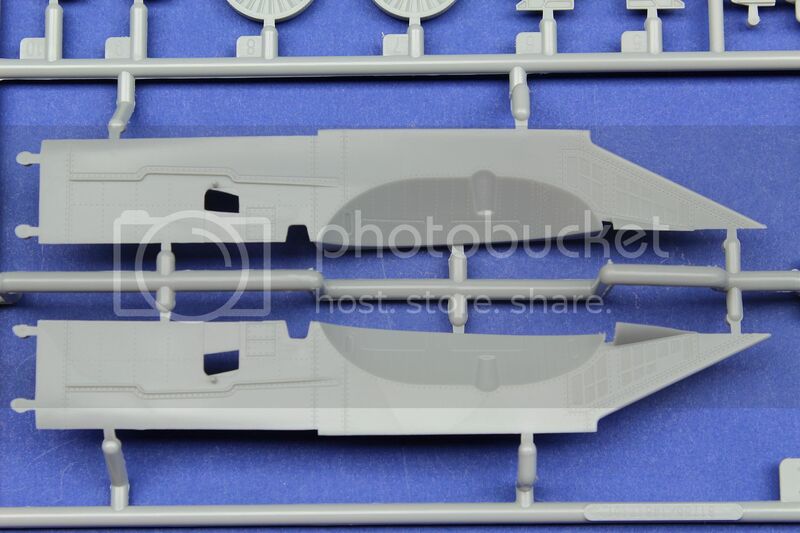 Keep an eye out on this thread as Anthony Wan send me some pictures of his work on the cockpit and hope he will share a bit more on the overall fit as he has quite a bit of the work already completed. 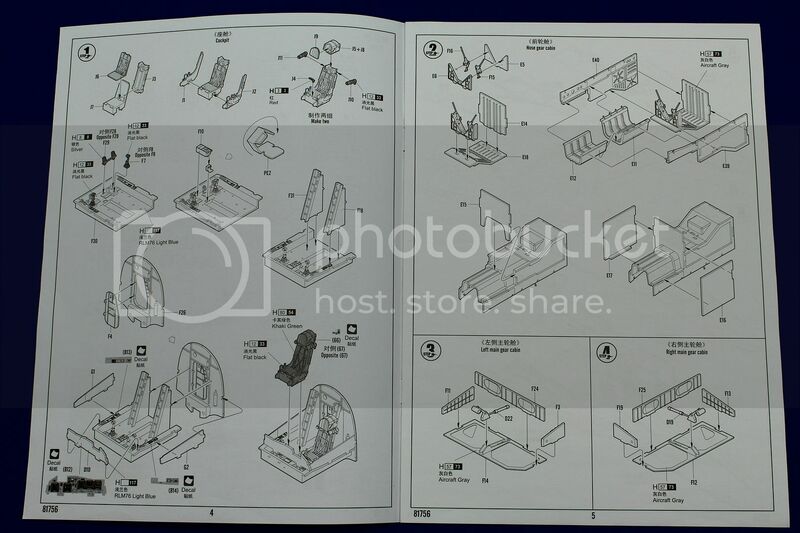 Furthermore I will make updates on any AM parts to come to market as soon as they are released.